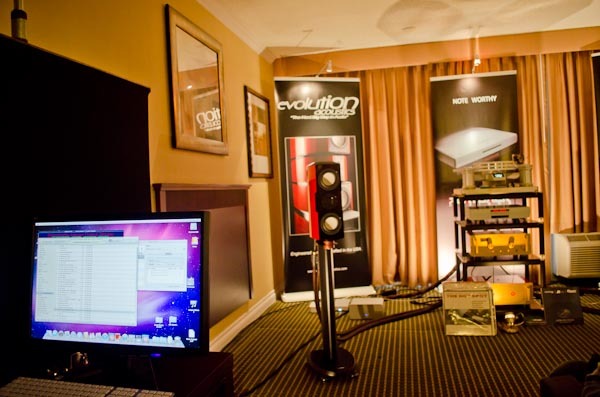 AXPONA has become the largest high-end audio expo in North America. 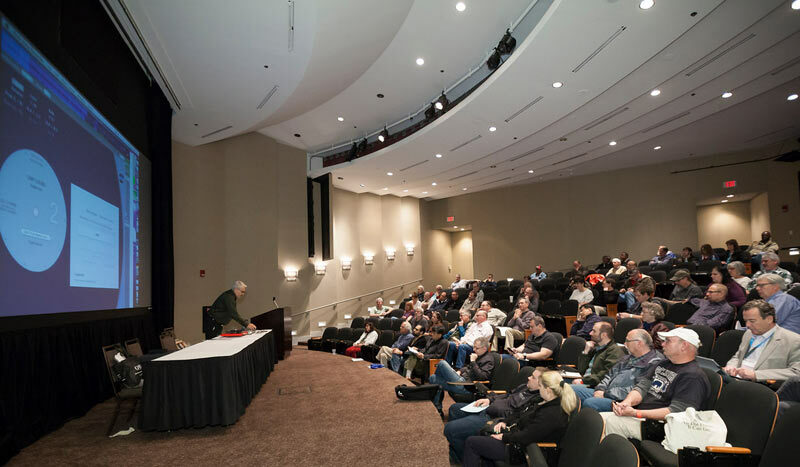 This will be our 11th time in a row setting up a listening room at this prestigious international gathering of audio enthusiasts held from Friday, April 12 through Sunday, April 14. 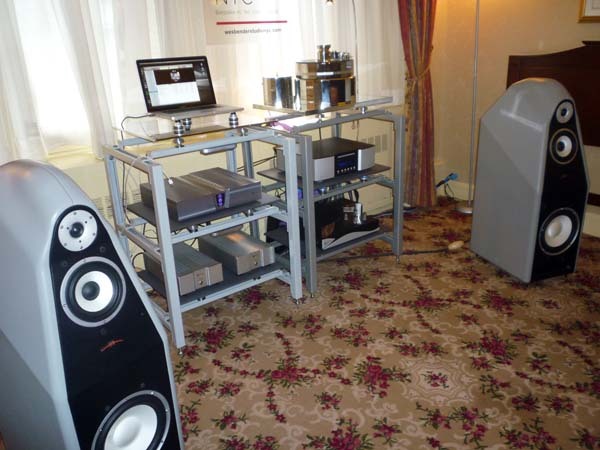 We will be in Utopia D with Richard Vandersteen / Vandersteen Audio and AudioQuest. Stop by and say hello! 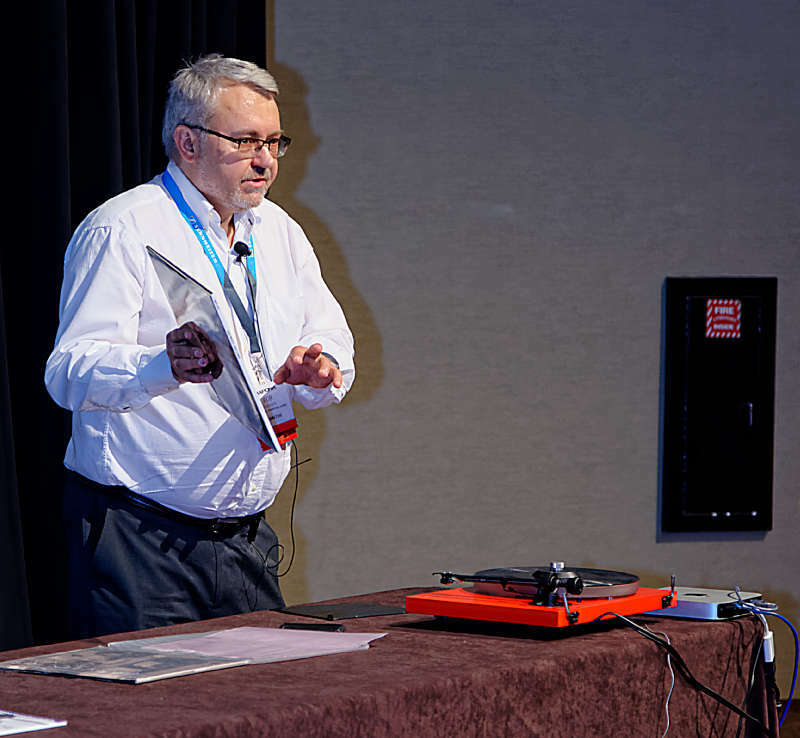 Don't miss the 4 PM Friday, April 12 Master Class seminar (in the Expo Hall) on current-mode phono stages, and our popular Vinyl Ripping Seminar at 5 PM, Saturday April 13 in our exhibit room. There is plenty of seating, everyone is invited. 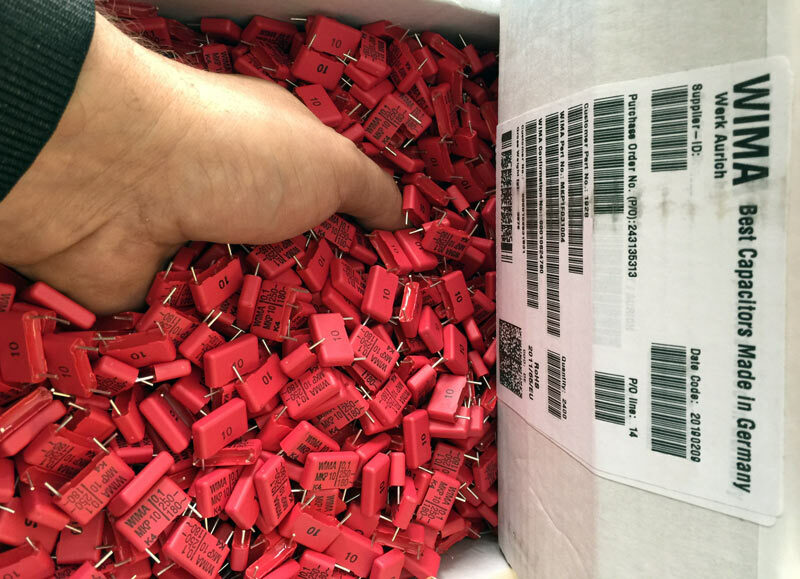 A new box of 2,400 WIMA evaporated metal film capacitors ready for selecting and matching to 0.1 percent tolerance, to meet the design specification for the precision (better than 0.1 dB) RIAA networks in all of our phono stages, from the Lino to the L20. The final assembly of the RIAA networks in our phono stages is done manually, using the selected capacitors. 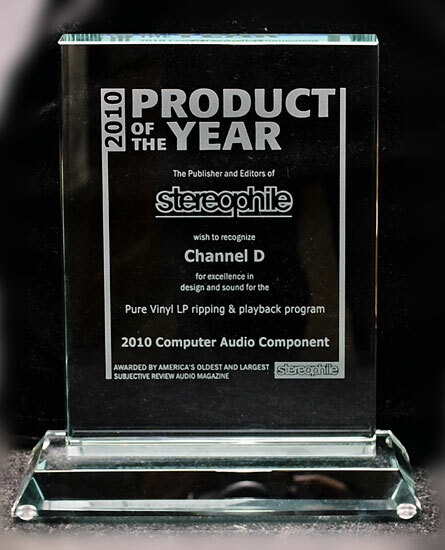 For the 10th consecutive year (2010-2019) in Stereophile, and 5th consecutive year (2015-2019) in The Absolute Sound, Channel D's Seta Model L preamplifier and Pure Music and Pure Vinyl (also 2014, The Absolute Sound) computer audio software are honored with Editors' Choice Awards from those publications. 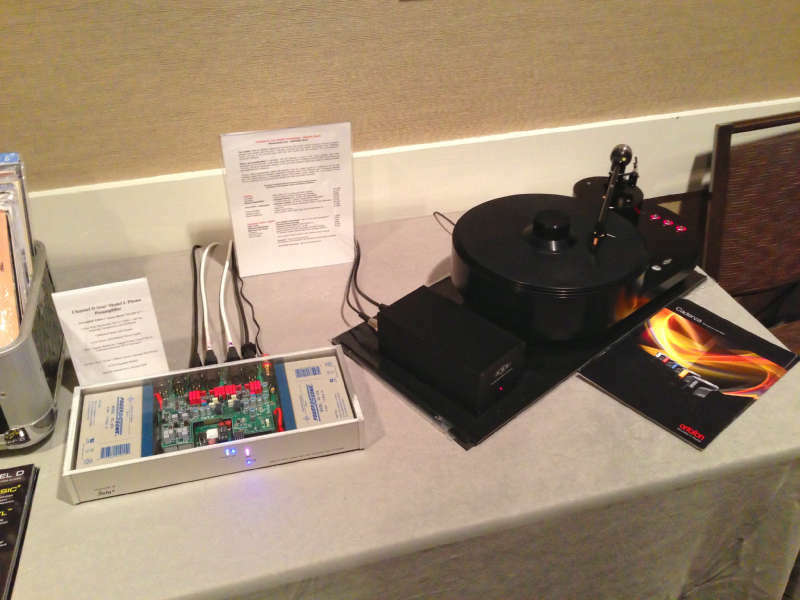 In addition, the Seta Model L phono preamplifier is ranked a "Class A" Recommended Component by Stereophile. 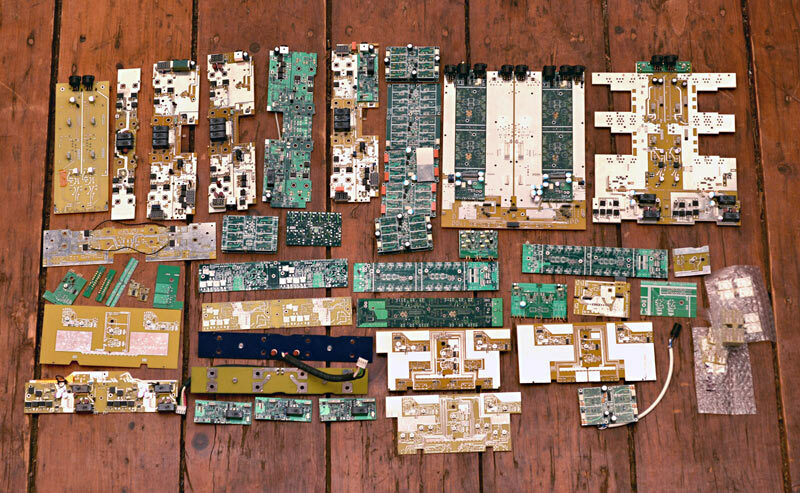 An example of some of the circuit board prototypes which were manufactured in the development of our Seta L20 (mk1), which took over 2 years. Chassis design went through a similar process. 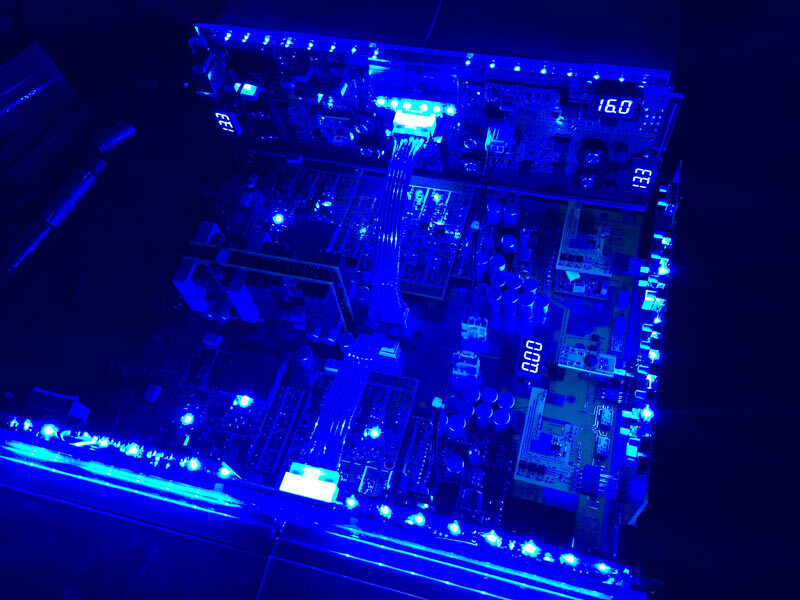 Cost scales exponentially with complexity; consequently, these prototypes were quite expensive to design, build, test and debug. However, this process is a necessity when designing and creating the highest performance products. 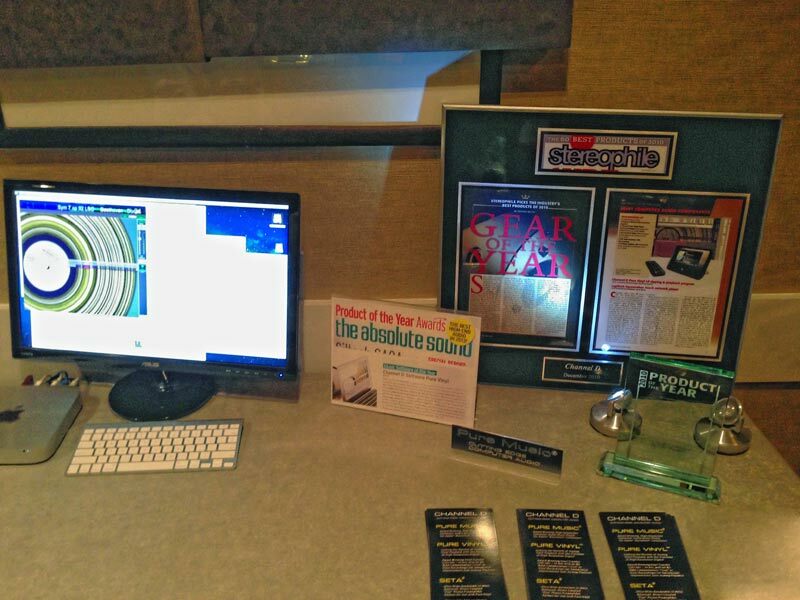 Channel D has been honored with the 2018 Global Excellence Award from LUX magazine for our software products! 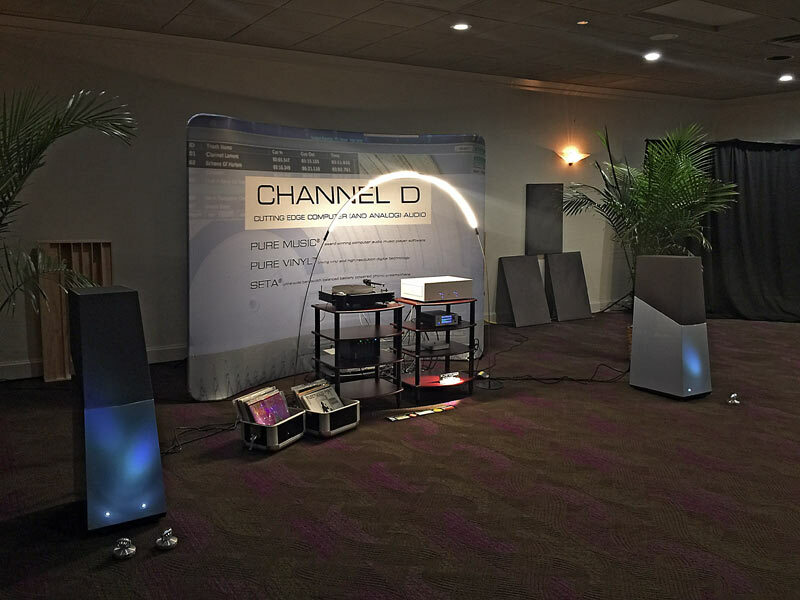 Thanks to Music Hall for joining us in staffing the exhibit room and showing their products, and Richard Vandersteen for loaning a set of Model 5A Carbon Loudspeakers (and himself!) for the event. 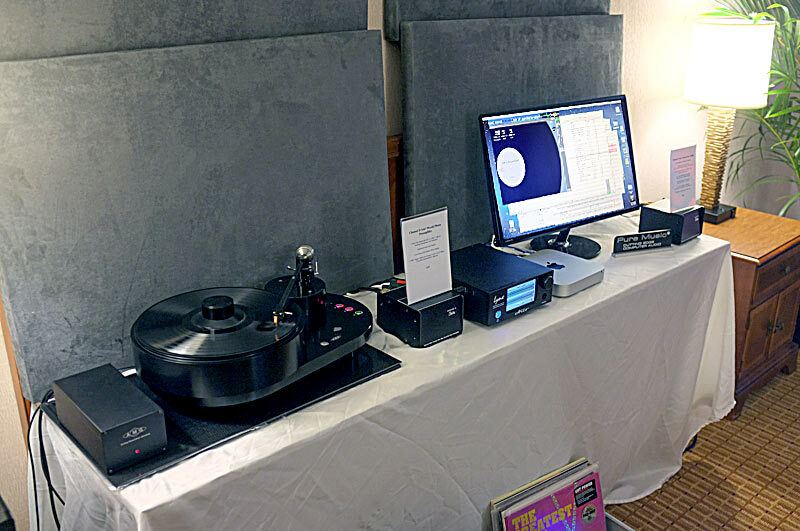 We featured our Pure Music and Pure Vinyl software, plus Seta Model L and Lino C phono stages. 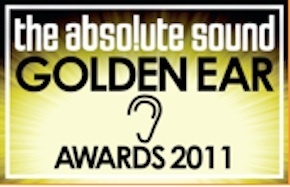 Absent was our amazing Seta L20: rarer than hen's teeth, because we don't have any at the moment! 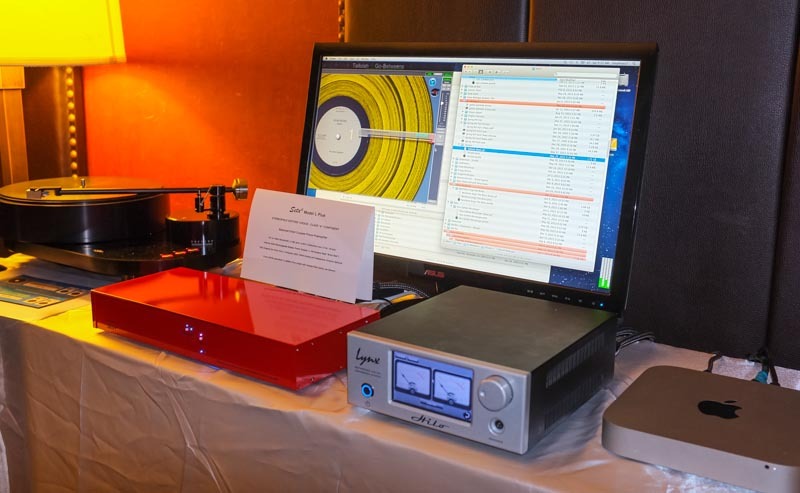 We'll be showing Pure Vinyl 5, plus preamps from our renowned line of phono preamplifiers including our amazing and elegant new Lino C, as well as our Pure Music computer audio software. Seta L20 - in basic black! We recently shipped a Seta L20 with custom black colored powder-coated chassis at a customer's request. Here it is undergoing the last stages of bench testing and quality control. The QC tests for each L20 take about two weeks! 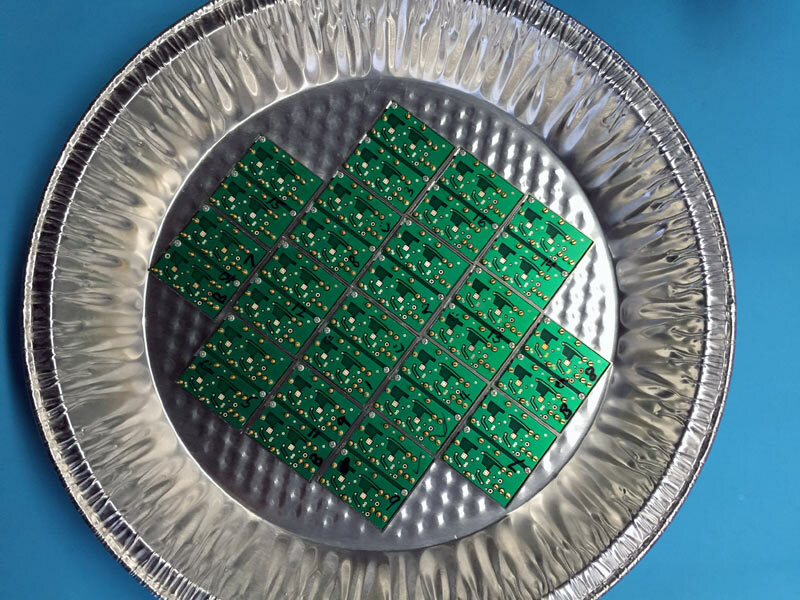 Set of sixteen tested and matched front-end modules that are to be used in one L20. Each module includes two fully balanced preamplifiers, so there are 8 per channel. 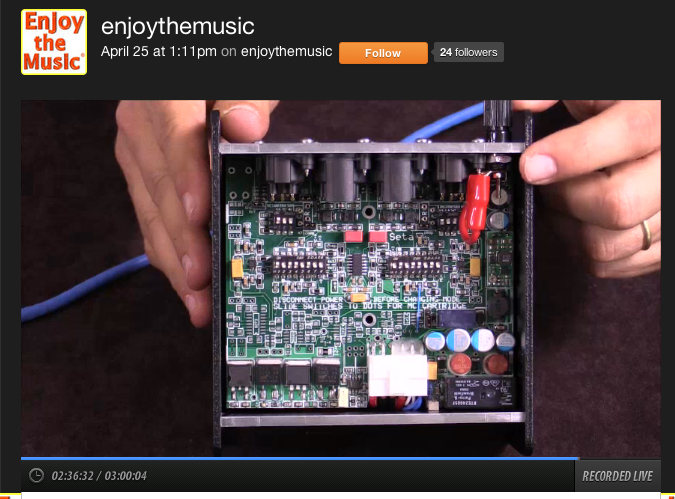 These modules directly amplify the signal from the phono cartridge. L20 inside illumination and battery condition monitors without internal cover, in the process of initial assembly and testing. We've upgraded the shipping packaging for the Seta L20 and now ship the preamplifier complete with battery packs installed, instead of shipping the battery packs separately. The L20 is mounted to a framework which is secured inside a padded, air-tight road case, which is then double-boxed. The shipping weight is 112 pounds. 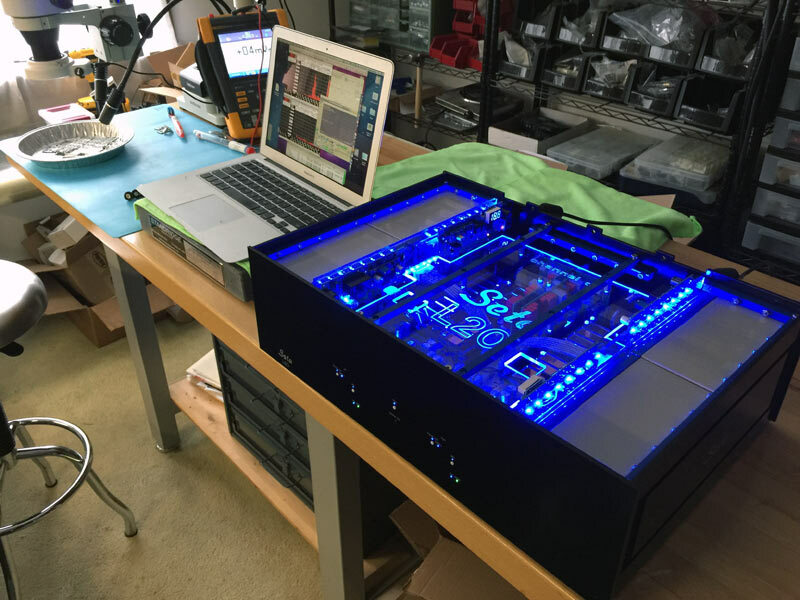 The new packaging and framework makes it practical for one person to unbox and install. We've also upgraded the battery packs to include new digital "fuel gauges" to indicate the battery condition. 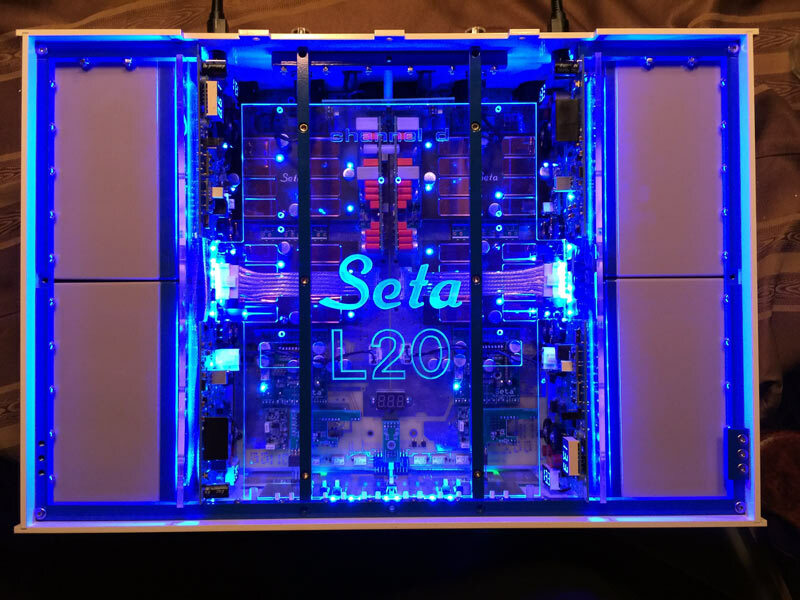 Our production of the L20 is now sold-out through the beginning of 2019. We will resume taking orders for the L20 in December 2018. 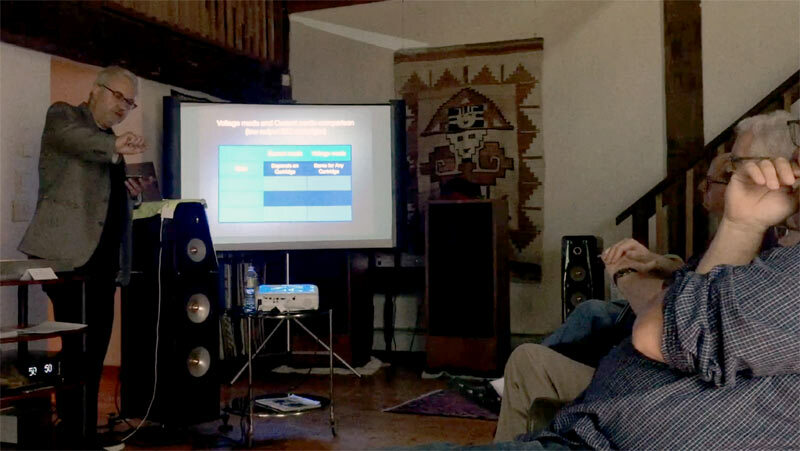 On June 23, 2018 Channel D's Director of Engineering gave a presentation on understanding cartridge electrical specifications and current mode phono preamplifiers to members of New York's Audiophile Society. It's a long (1 hour 16 minutes) video... Channel D coverage begins at 1:04:42. 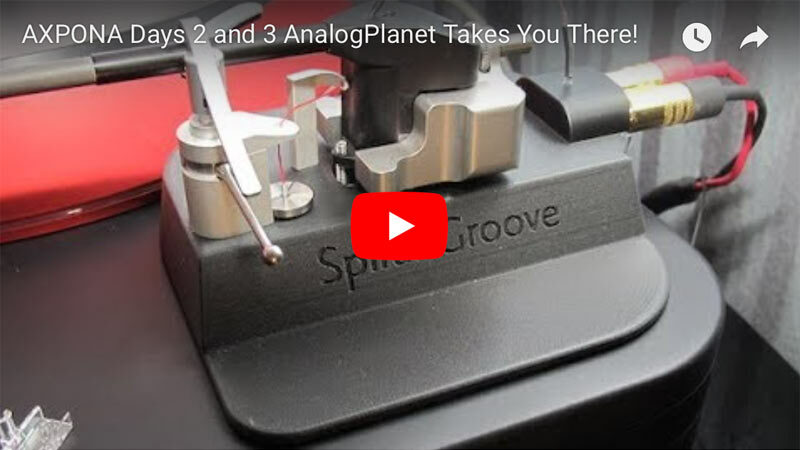 AXPONA 2018 Day 2 and 3 AnalogPlanet Takes You There! 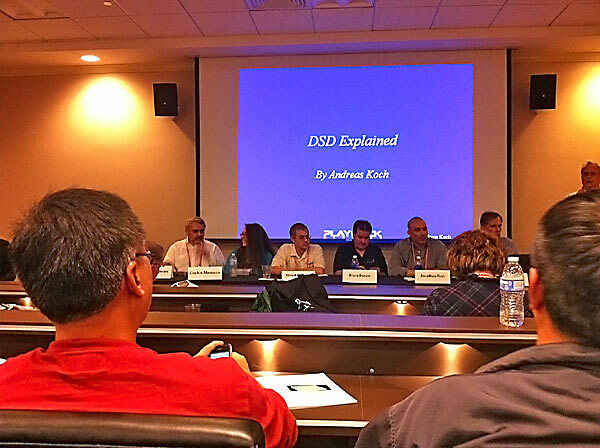 Here is a link to a higher-resolution version on YouTube. The Lino C is a very high performance, reference quality current-mode phono preamp priced like a high performance voltage mode MC preamplifier. 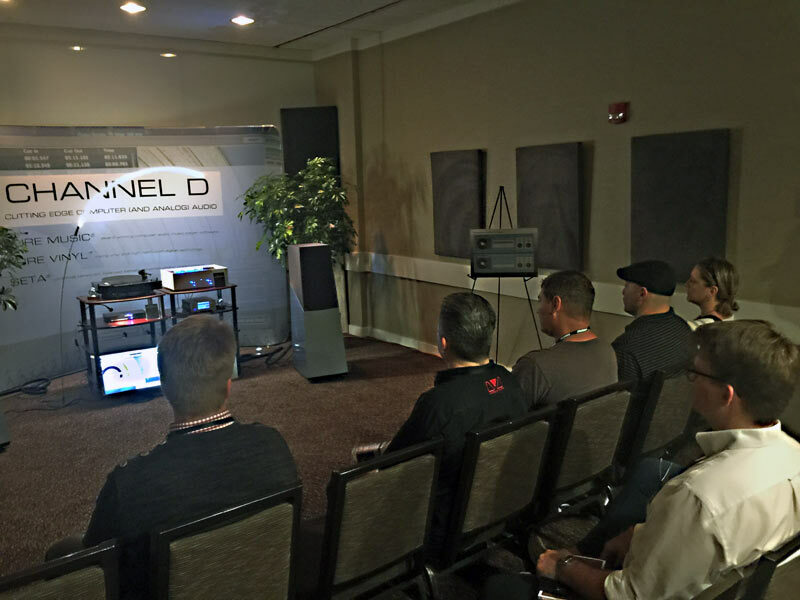 The Lino C uses current-mode technology adapted from our Seta® L20 phono stage. The Lino C features balanced inputs plus independent balanced and unbalanced outputs. Though the signal gain of a current-mode amplifier depends on the impedance characteristics of the cartridge used, gain is also adjustable over a 12 dB range. 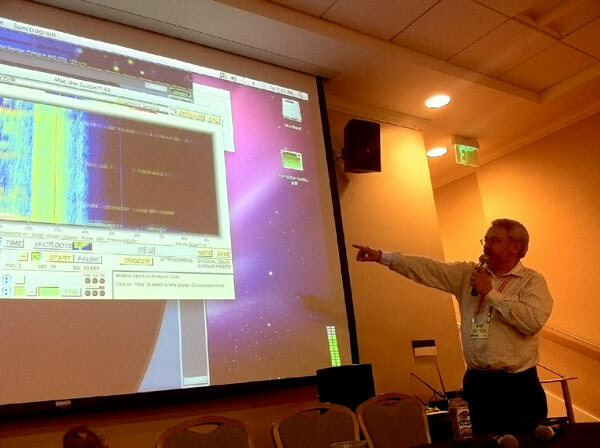 RIAA EQ accuracy is better than 0.1 dB from 20 - 20kHz. The RIAA EQ also can be disabled on the balanced outputs, providing simultaneous “flat” (for LP to digital transfers) and RIAA unbalanced signal outputs. 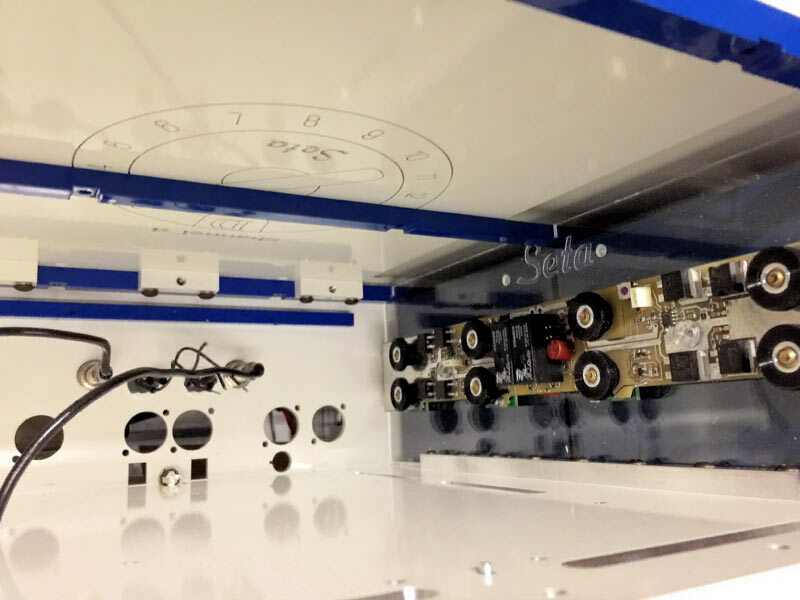 An internal ultra low noise AGM rechargeable battery power supply is optional, and is based on the technology used in our Seta phono preamplifiers. The Lino C retail price is $2499. Chassis finish options are beautiful, brushed aluminum (shown above) and glossy black powder coat (extra cost). 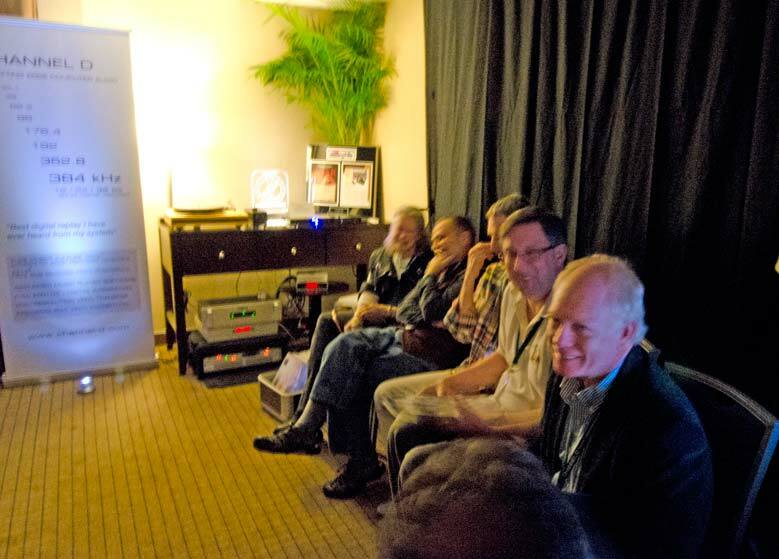 This will be our 10th time in a row setting up a listening room at this prestigious international gathering of audio enthusiasts! 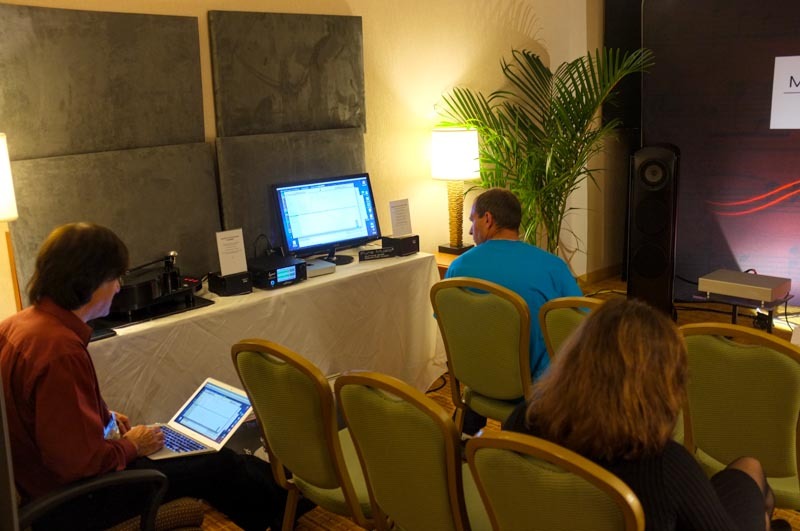 AXPONA is at a new venue this year, and we will be at the show in Utopia D with room sharing partner Richard Vandersteen / Vandersteen Audio. Stop by and say hello! 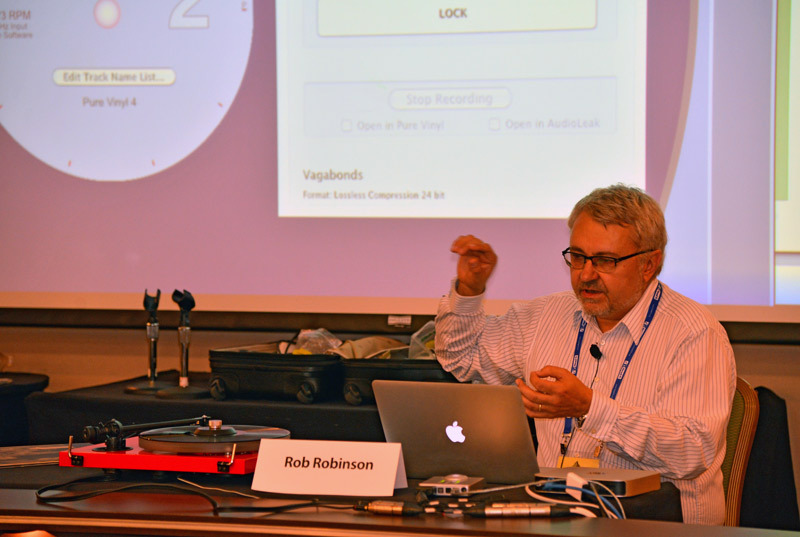 Also, don't miss the Vinyl Ripping Seminar at 10:30 AM, Saturday April 14 in the Auditorium. 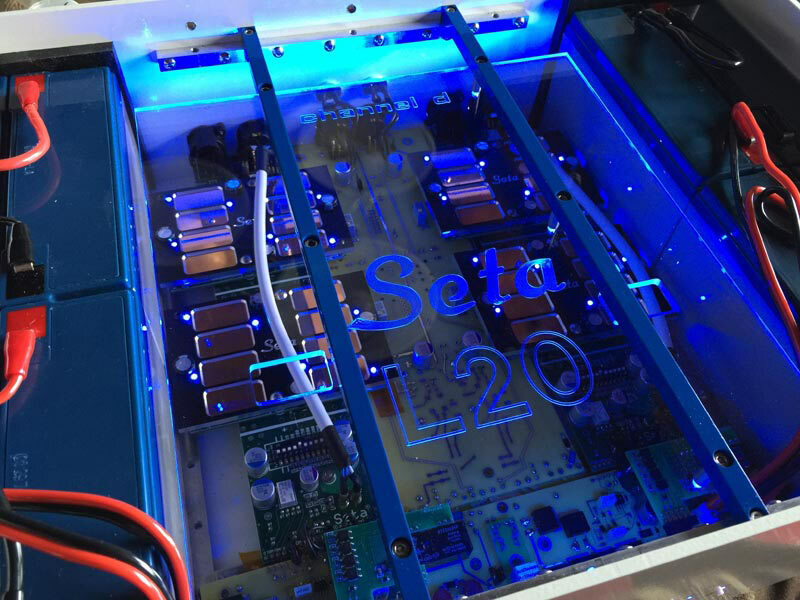 Some images from around our office featuring our exciting new Seta L20 preamplifier, as we fill orders for our latest product. A view as if "standing in and looking up from inside" an L20 chassis awaiting installation of the main circuit boards. 10mm thick L20 bottom chassis panel undergoing final milling operations in our machine shop. 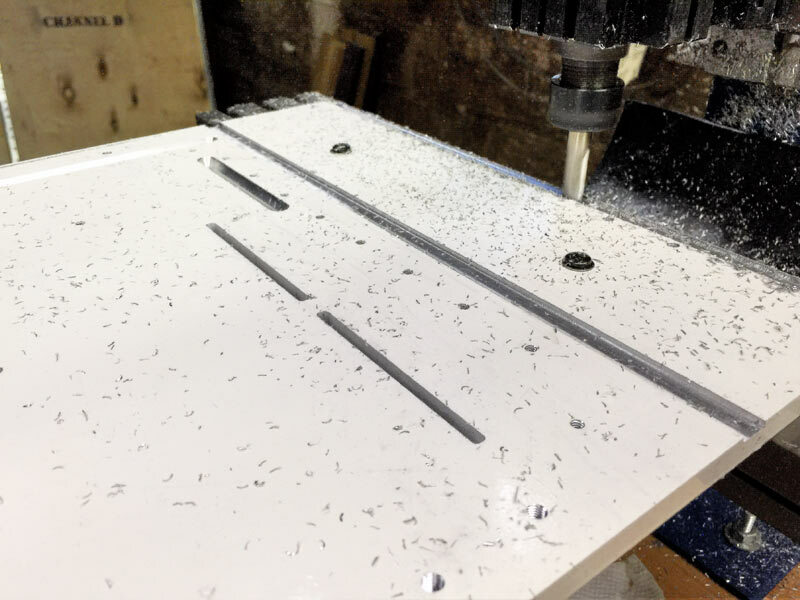 Namely, milling cavities for the slide-in battery pack "feet" and chamfering of the chassis ventilation slots for more efficient airflow. 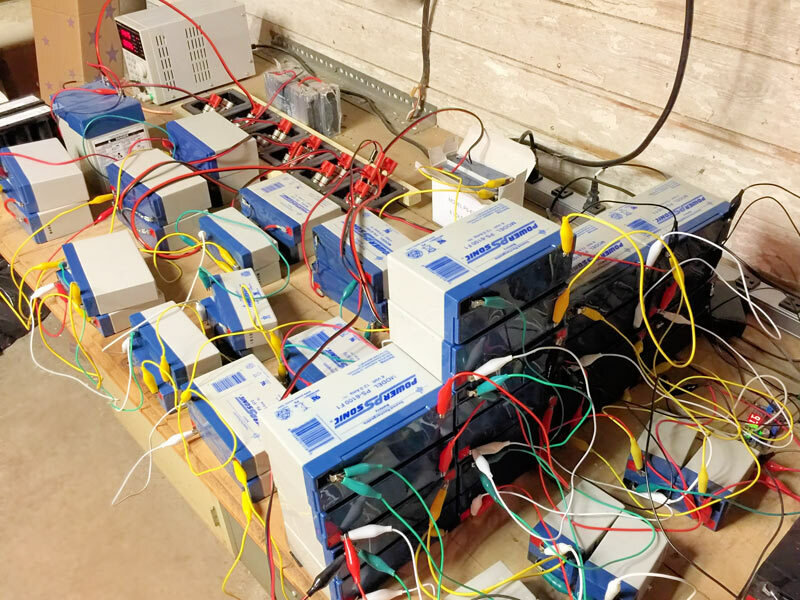 View of 6-volt and 4.5-volt AGM batteries undergoing final top-off charge and QC evaluation before installing in Seta preamplifiers. Part of our electronics lab where the major components of each L20 also undergo final inspection and QC. The L20's two user-installable/replaceable high-capacity long life rechargeable battery packs are shipped separately from the preamplifier to keep the L20's overall shipment weight manageable by one person. 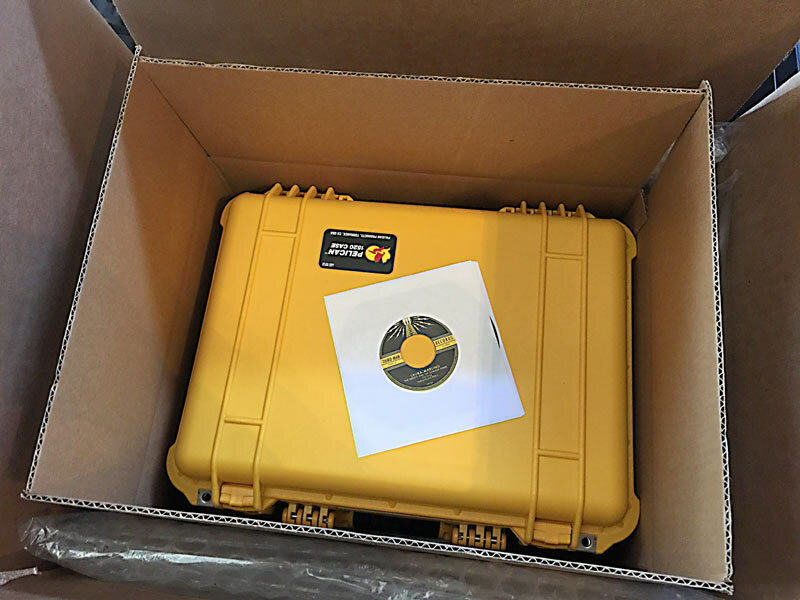 The packs are protected from rough handling in transit by a shock-absorbing high density foam-filled 20" x 7" x 16" watertight road case (the 7" 45 is shown for scale) which is then double-boxed. 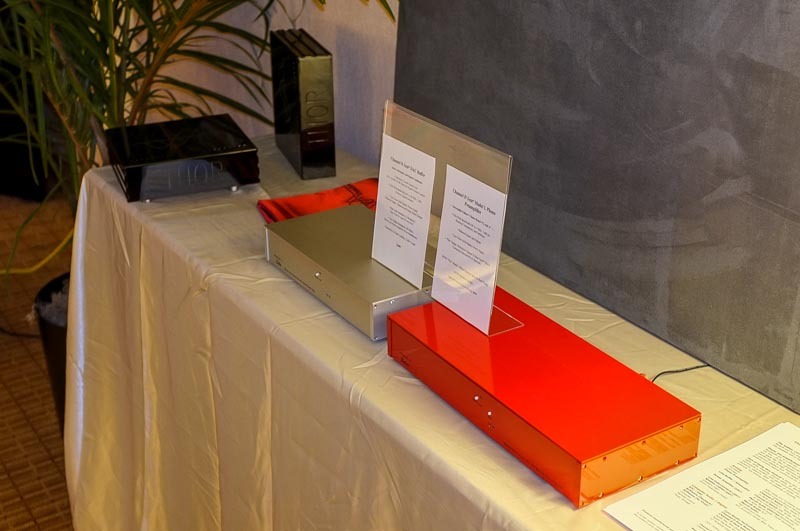 The L20 preamplifier itself is also packaged in a similar way for shipment. Some local color. View from our office / circa - 1780 renovated barn on a recent winter morning with the treetops bathed in golden sunlight. 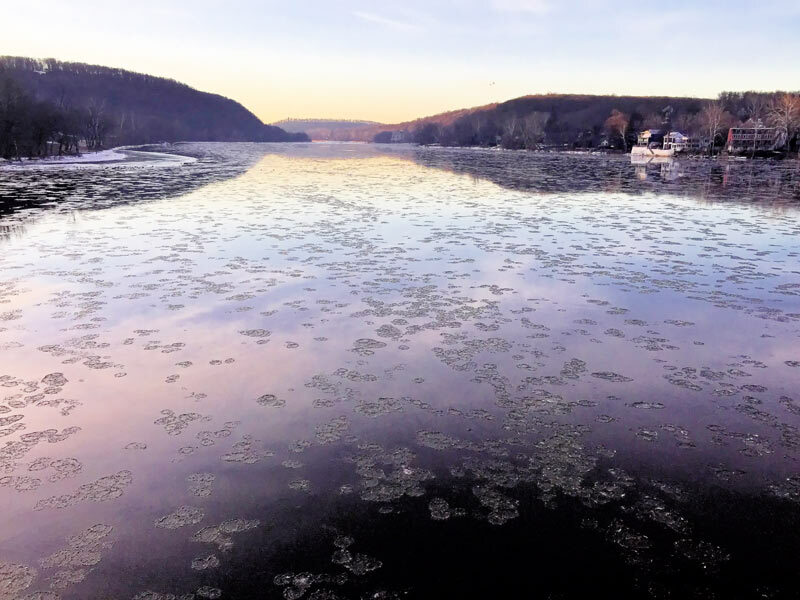 The nearby, bucolic and serene Delaware River on an icy winter morning. 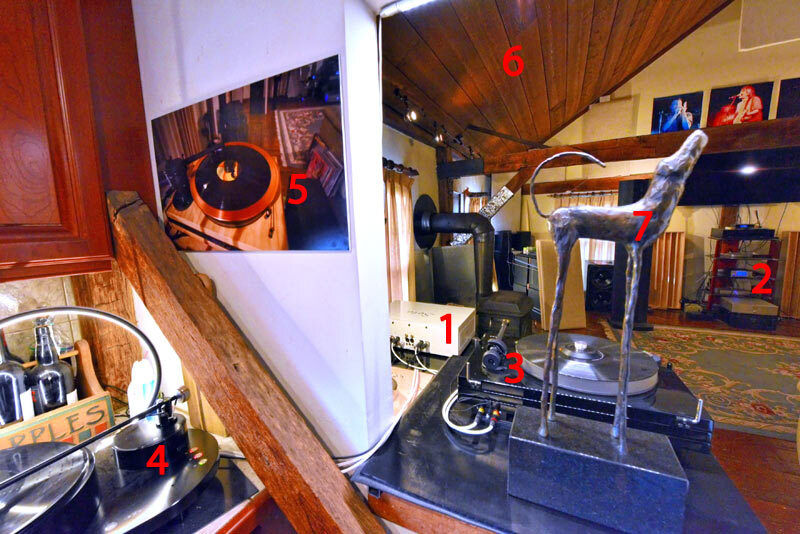 This pastoral, old-time milieu is an ideal environment for developing audio products. 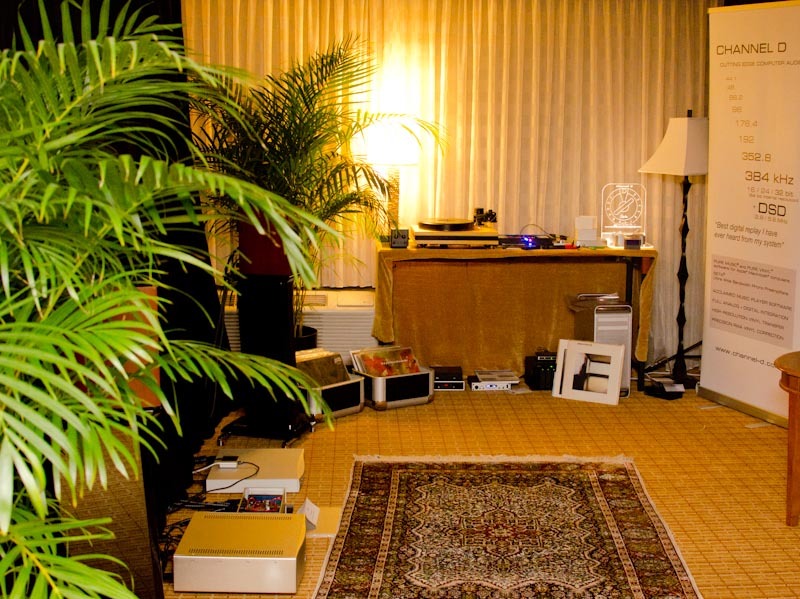 All of our phono stages are evaluated in our reference listening room. 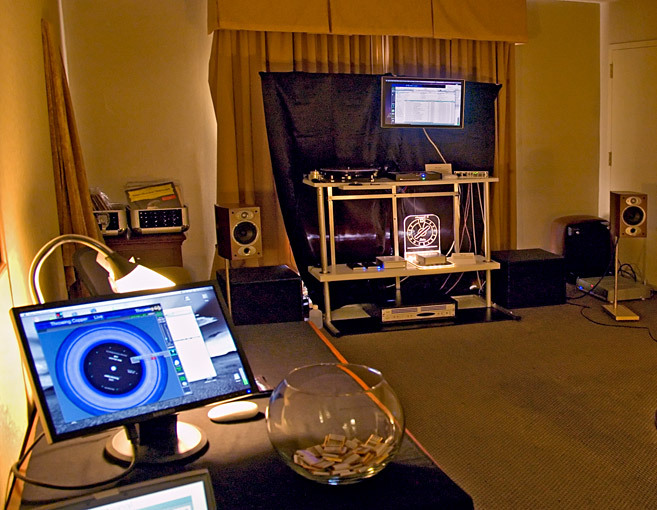 Here is an L20 undergoing listening tests with different turntables and cartridges. 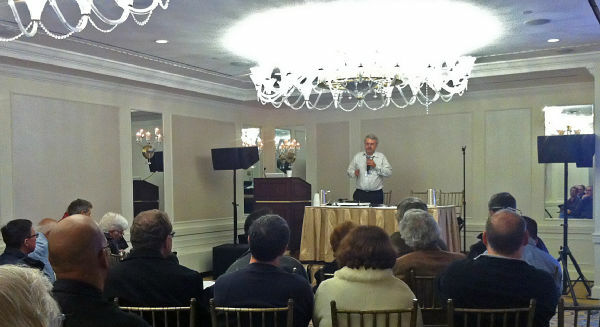 (2) Reference audio system, on opposite side of room. The L20, as well as all of our other phono preamps, easily drives long signal interconnects. 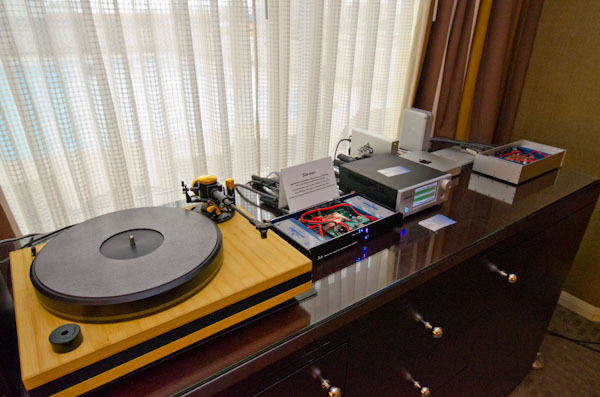 (7) Our 21st - century "Nipper"
We'll be showing the incredible new Pure Vinyl 5, plus preamps from our renowned Seta line of phono preamplifiers (including our new Seta L20), as well as Pure Music. 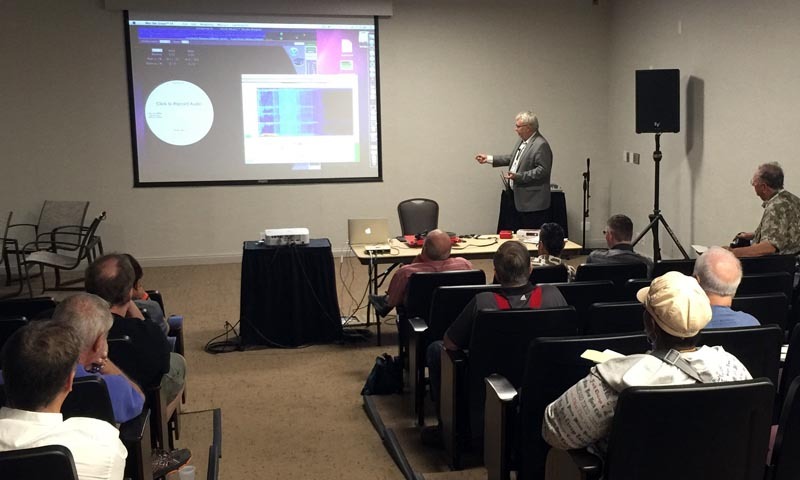 Don't miss our popular Vinyl Ripping Seminar at 10 AM Saturday in the expo seminar room. 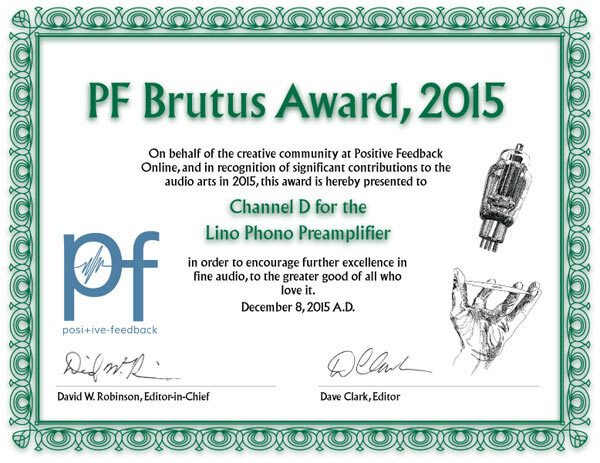 As part of the California Audio Show's Prize Drawing, we're donating one of our award-winning Lino phono preamplifiers, with a retail value of $1,448. 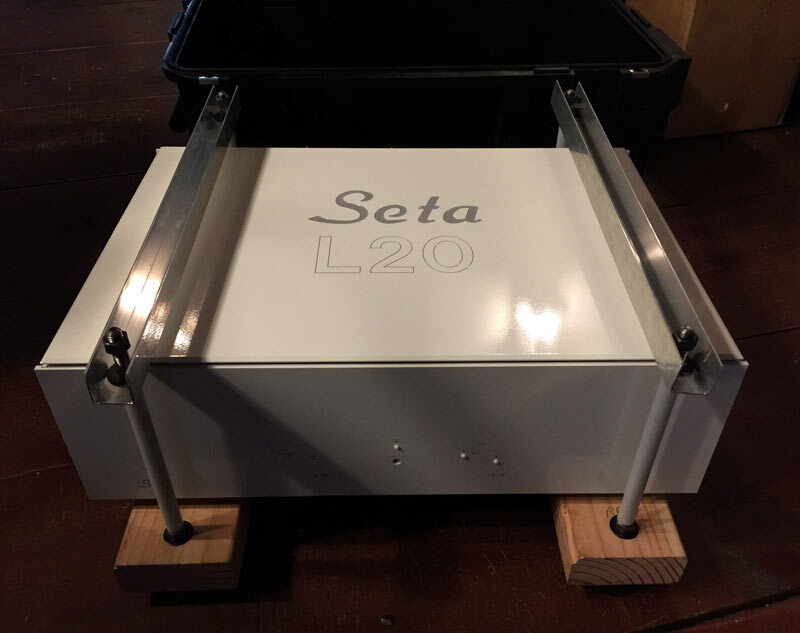 We'll also be showing one of our new Seta L20 phono preamplifiers. 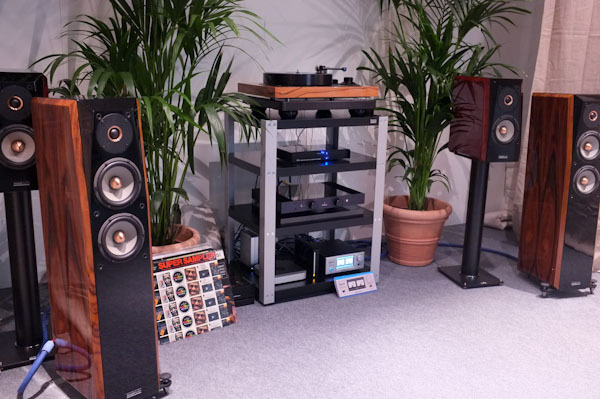 We'll be showing the incredible new Pure Vinyl 5, plus preamps from our renowned Seta line of phono preamplifiers, as well as Pure Music. 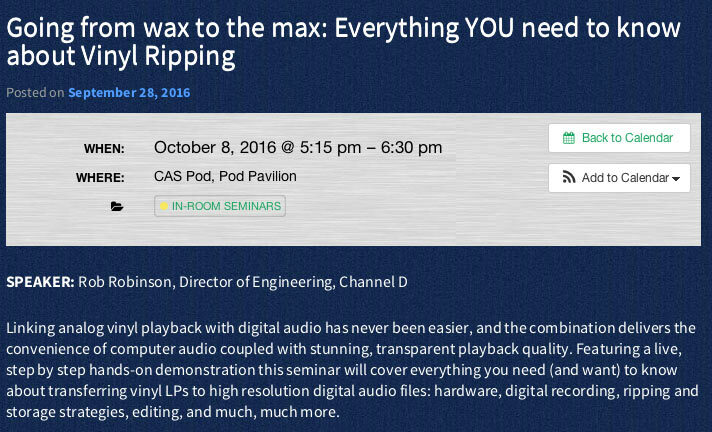 Don't miss our popular Vinyl Ripping Seminar at 1:30 PM Saturday in the expo seminar room. 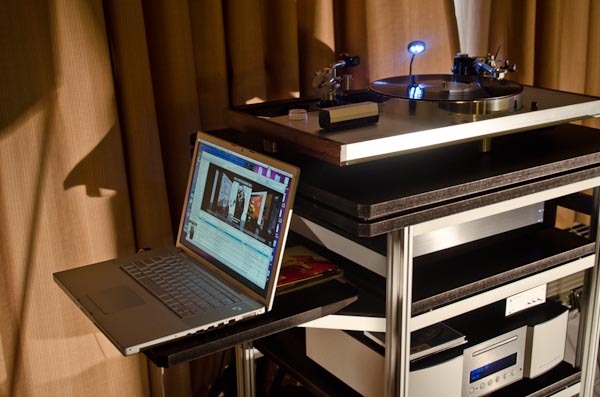 A Pure Music user let us know about a well-written article regarding using Pure Music's / Pure Vinyl's multi-way crossover feature. Click to read article. Ever since we began developing and marketing software products over 21 years ago, we've always endeavored to support as wide a range of legacy computer operating system (OS) versions and computers as technically possible. Due to extensive optimization for low CPU usage, our products can still be used on 12 year old computers running a 10 year old operating system (Mac OS X 10.5, first released in 2007)! However, Internet commerce sites (including the merchant service that processes our transactions) are migrating their systems to something called TLS 1.2 ("Transport Layer Security," previously called SSL) due to Internet hacking and security concerns. Unfortunately, this technology is not backward compatible with older OS versions - or at least, old OS versions aren't being updated to support it. So, while you may be able to use our products with computers running old OS versions, starting recently you cannot easily purchase them via the Internet with a web browser running under an old OS. Our software products are compatible with computers running Mac OS versions up to 10 years old. This presents an unpleasant dilemma. Due to these circumstances which are beyond our control requiring supporting increasingly restrictive (but nonetheless necessary) Internet security policies, for future product releases we will likely be discontinuing support for older OS versions. As of April 2017, the oldest Mac OS version that supports current Internet transaction security policy is 10.9 ("Mavericks"). Our products (that is, the software license codes) are delivered using email, so they also can be purchased with web browsers running under updated versions of Windows or Linux, as well as on portable devices running iOS, Android, etc. 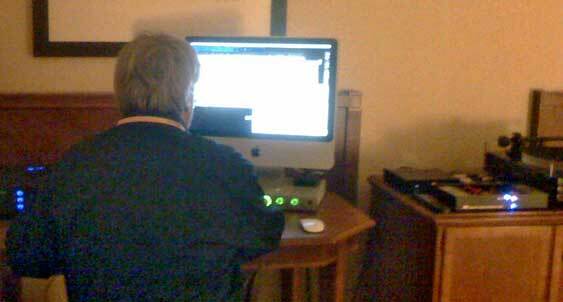 Apple computers supporting MacOS 10.9 are mid 2007 or later iMacs or 15 and 17 inch MacBook Pros; 2008 or later Mac Pro and MacBooks, and mid 2009 or later Mac Minis and 13 inch MacBook Pros. *Mozilla Firefox 45.9.4 "Extended Support Release" (esr) supports TLS 1.2, runs on MacOS 10.6 through 10.8 and can be used to purchase products from our web store. It can be downloaded here. Click on the link, then be sure to click on Show Firefox 45, and finally download the appropriate language-localized version. 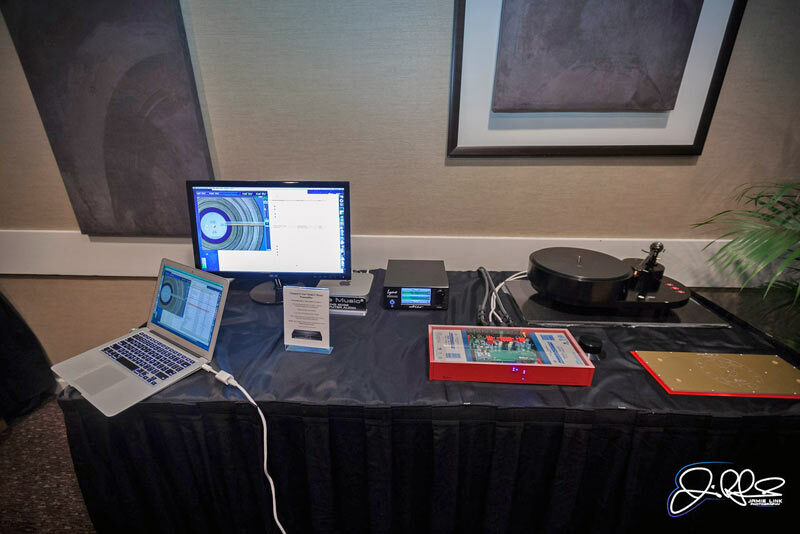 At AXPONA 2017, we introduced our brand new Seta® L20 moving coil phono preamplifier. 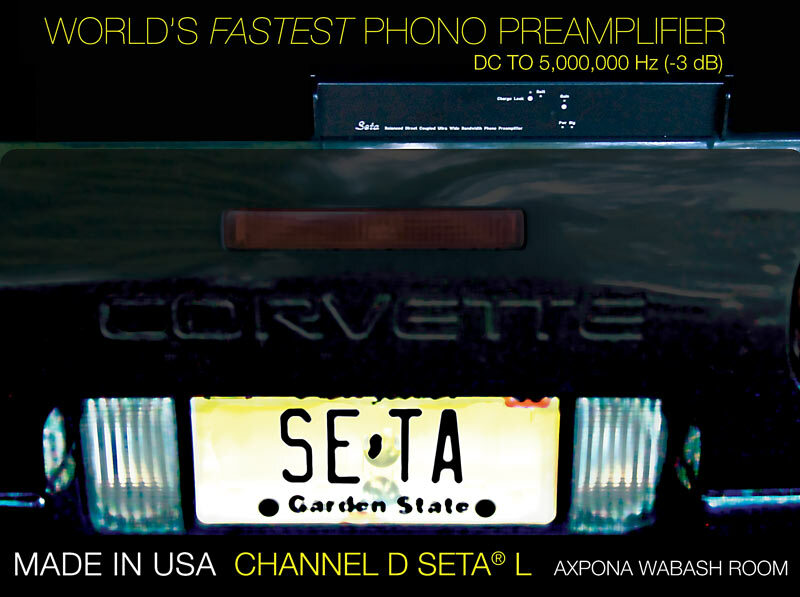 Several years in development, the L20 represents a cost-no-object statement product that builds on the strengths of our award winning Seta Model L MC phono preamplifier by increasing the frequency bandwidth to 20 megahertz (20,000,000 Hz) – 1000 times the bandwidth of audible frequencies - while simultaneously and dramatically increasing the signal to noise ratio and reducing harmonic and intermodulation distortion to nearly unmeasurable levels. The Seta L20ʼs lower noise and ultra-low harmonic and intermodulation distortion and ultra wide signal bandwidth pays clear and discernible dividends by delivering breathtaking clarity, depth and accuracy from LPs. 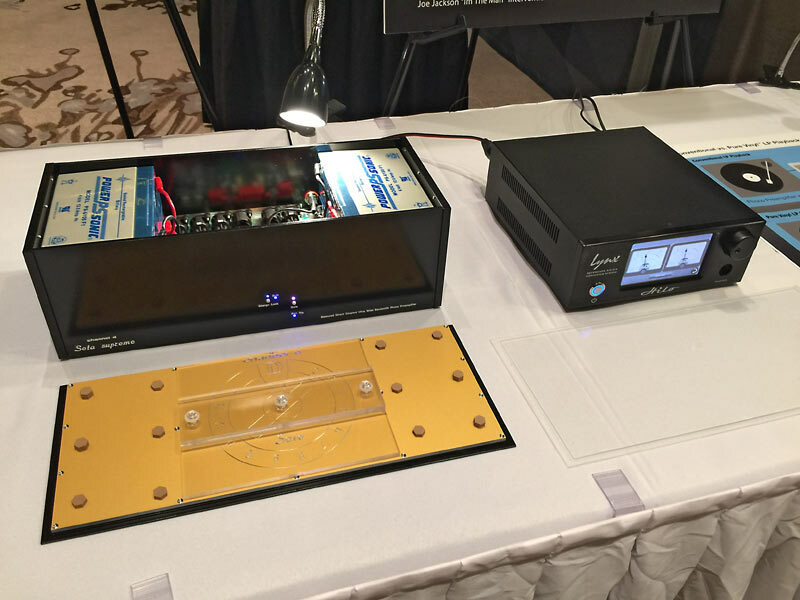 The L20 is a ground breaking phono preamplifier in significant ways. A dual-mono, direct coupled, fully balanced design, each channel has its own independent rechargeable battery power supply. Though the left and right channels share the chassis, they are galvanically isolated from each other and from the outside world. Chassis common is floating but can be tied to either or both channels. The equivalent input noise of the L20, measured with a 1 ohm source resistance, is an astonishingly low -134 dBu, despite the extreme signal bandwidth capability. The L20ʼs 24 volt power supply rails are able to swing 20 volts peak to peak into a 600 ohm load from DC to 100 kilohertz with negligible distortion. The L20 includes selectable voltage and current amplification modes as well as front panel adjustable gain and Mono summing mode, plus the Setaʼs unique cartridge balance trim control, accessible via the front panel. The L20 includes a 576 watt-hour internal rechargeable battery power supply. 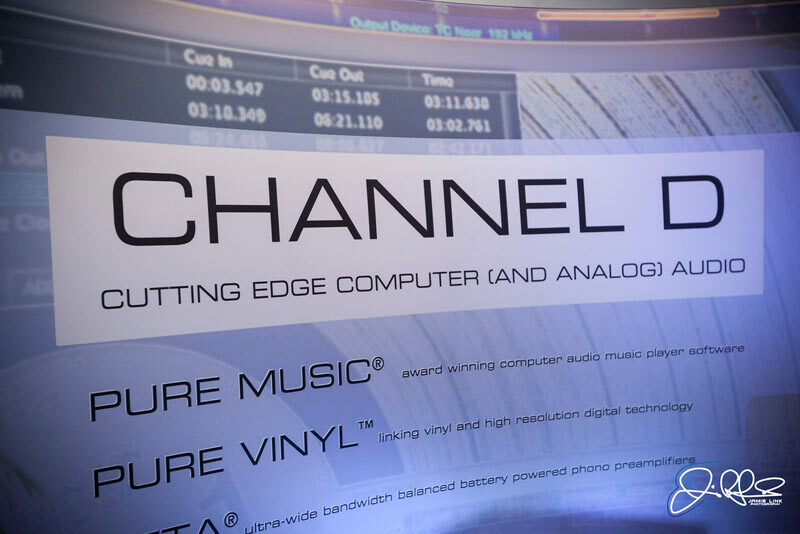 Battery recharging is automatically managed via proprietary Channel D circuitry, the same as used in the Model L and all other Channel D Seta preamplifiers. Pricing to be announced, but will be substantially higher than other preamplifiers in our product line. 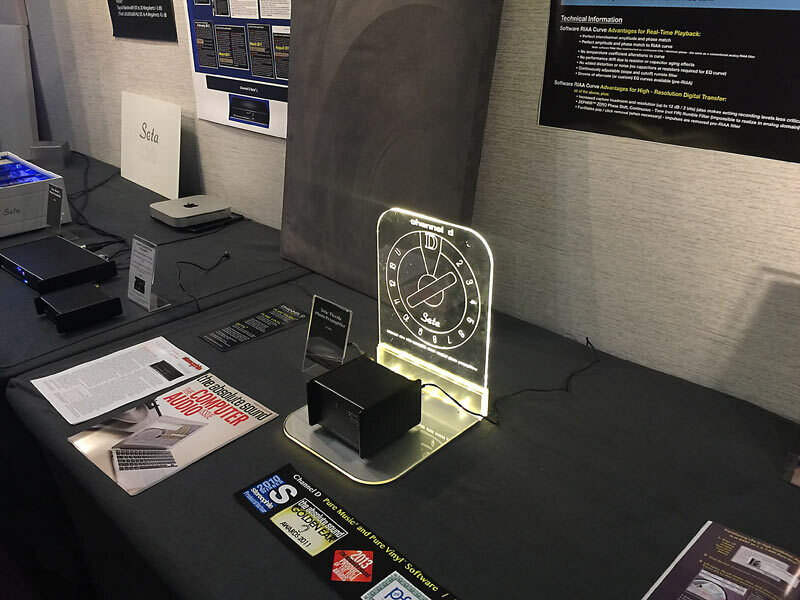 In advance of our appearance at AXPONA 2017, here is a preview of Pure Vinyl 5. 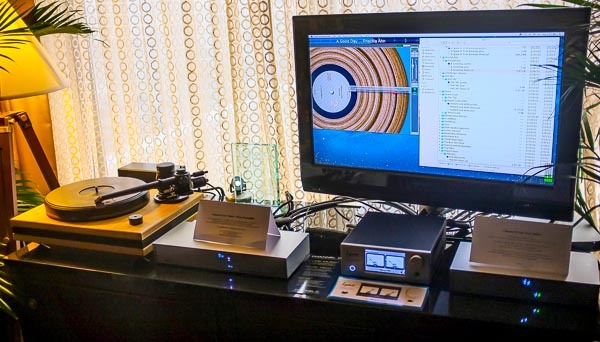 This is exactly the same build version that we will use to demonstrate Pure Vinyl in our exhibit room and Vinyl Ripping Seminar. Please be sure to read the enclosed READ ME document, before using it. Click to download (note: link removed, please see newer preview version link above). 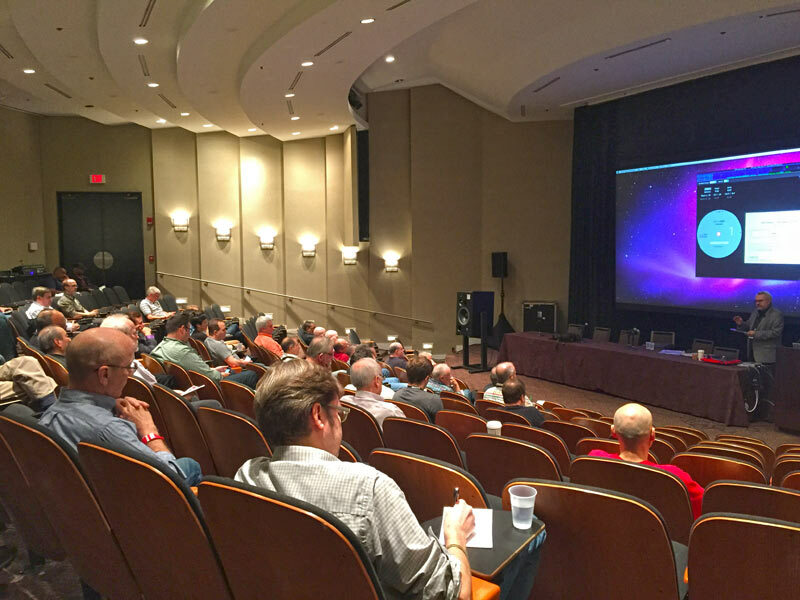 This will be our 9th time in a row setting up a listening room at this prestigious international gathering of audio enthusiasts! 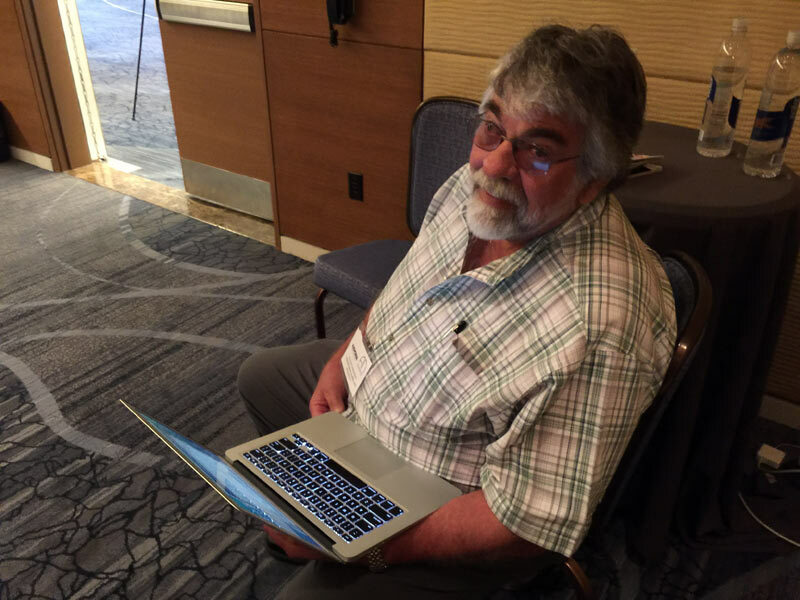 As in previous years, we will be in the Wabash Room on the bottom level of the show, directly across from the MBL and the Synergistic Research exhibit rooms. We'll be introducing the incredible and long-awaited new Pure Vinyl 5! Details about the many major new features will follow. 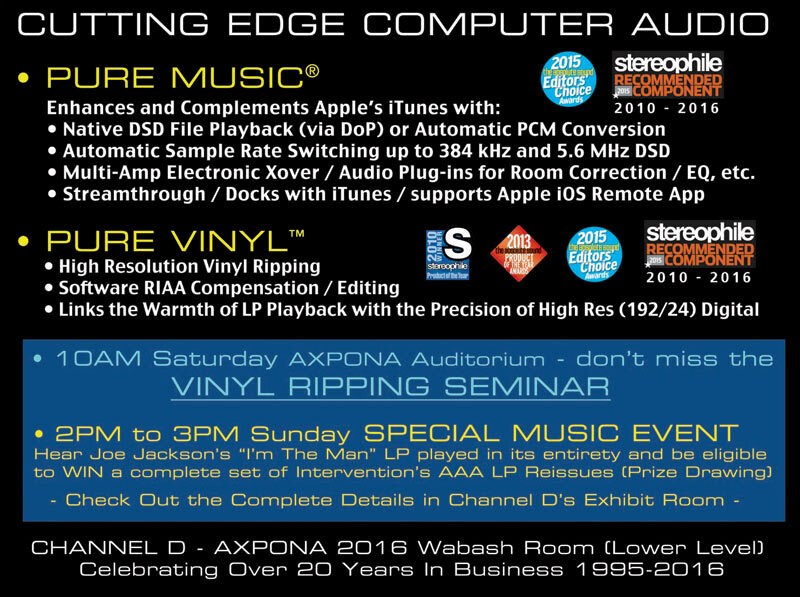 Don't miss the Vinyl Ripping Seminar at 10 AM, Saturday April 22 in the Auditorium. 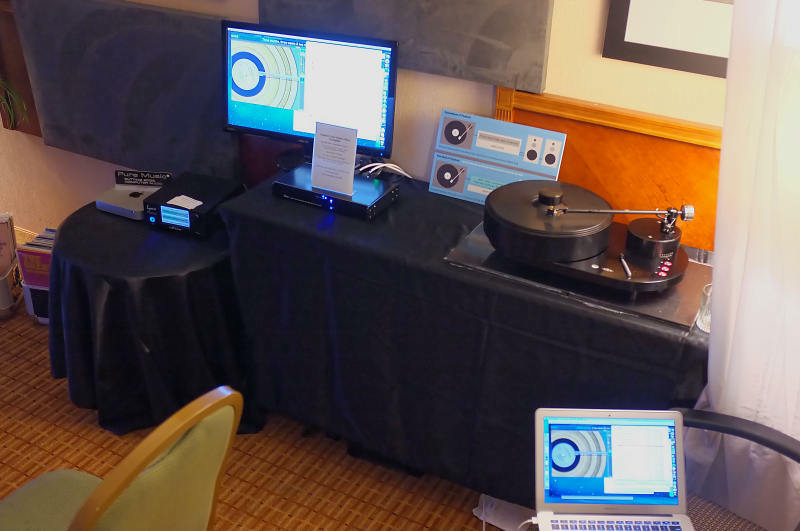 The Absolute Sound (Andrew Quint RMAF 2016 Report) - Party in the Pod:"This was, to me, audiophilia at its best - critical listening with the best gear that permits the recording arts to effectively deliver an artist's message." 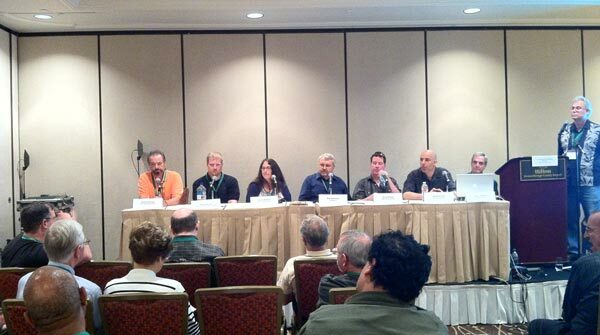 On Saturday October 8, we'll again be presenting a Vinyl Ripping Seminar at Rocky Mountain Audio Fest. 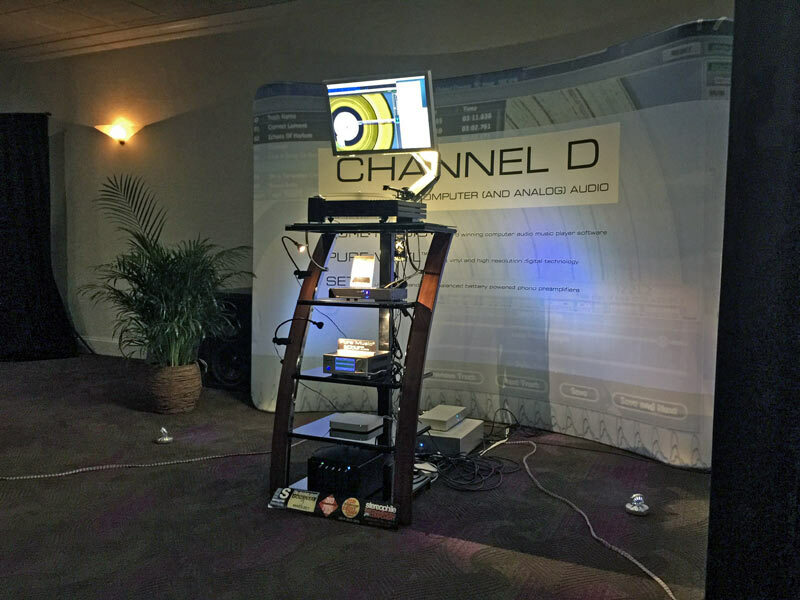 Channel D at 2016 Rocky Mountain Audio Fest - Party in the POD and Classic Album Sundays! 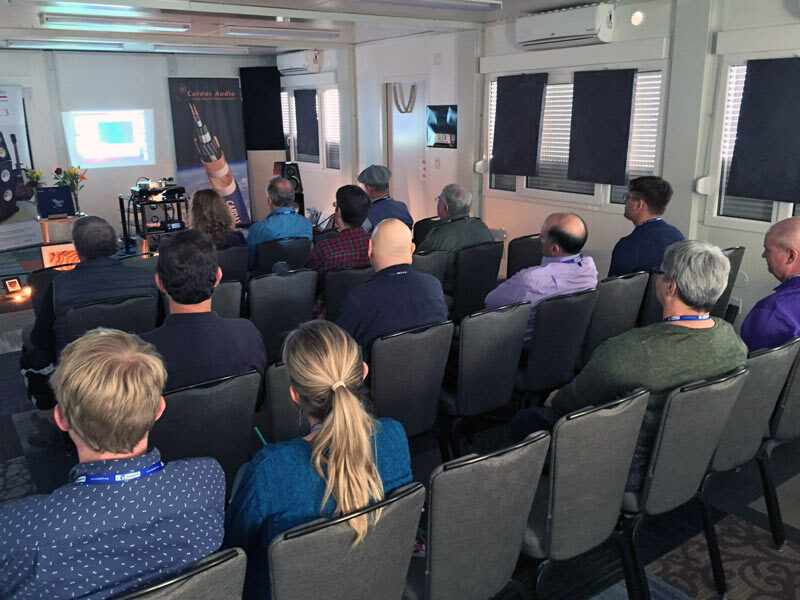 This will be our 11th time in a row setting up a listening room at this prestigious international gathering of audio enthusiasts! 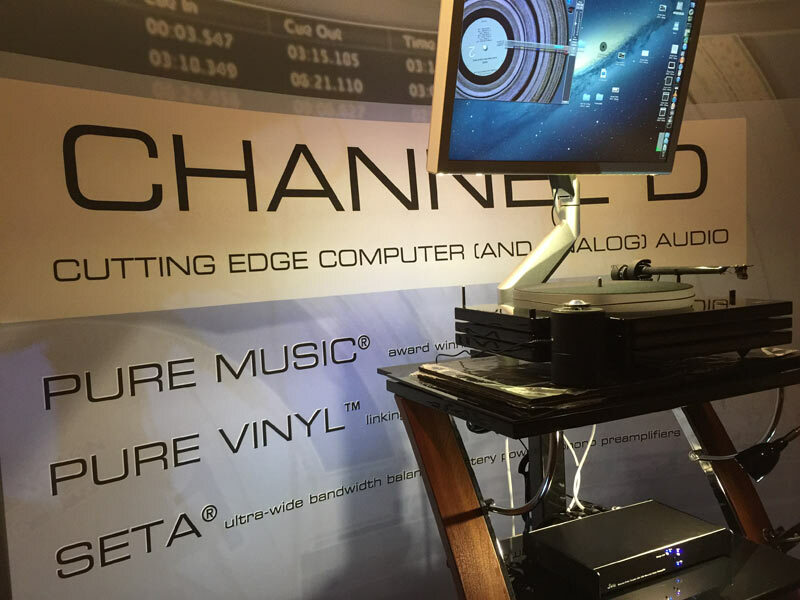 Channel D was granted US Patent #9,389,827 B2 for "SYSTEM AND METHOD FOR DISPLAYING AND EDITING DIGITALLY SAMPLED AUDIO DATA" - our novel invention for creation of Cue Guide images in Pure Vinyl, used for track editing. This follows our UK Patent #GB2454106 and US Patent #8,793,580 B2. Kagi, the Berkeley, California based e-commerce merchant services we have used for more than 19 years to collect and process product payments, has suddenly announced that they have ceased operations. Updated purchasing links are now in place on our website for our products. Please see this page on our website for important additional information. 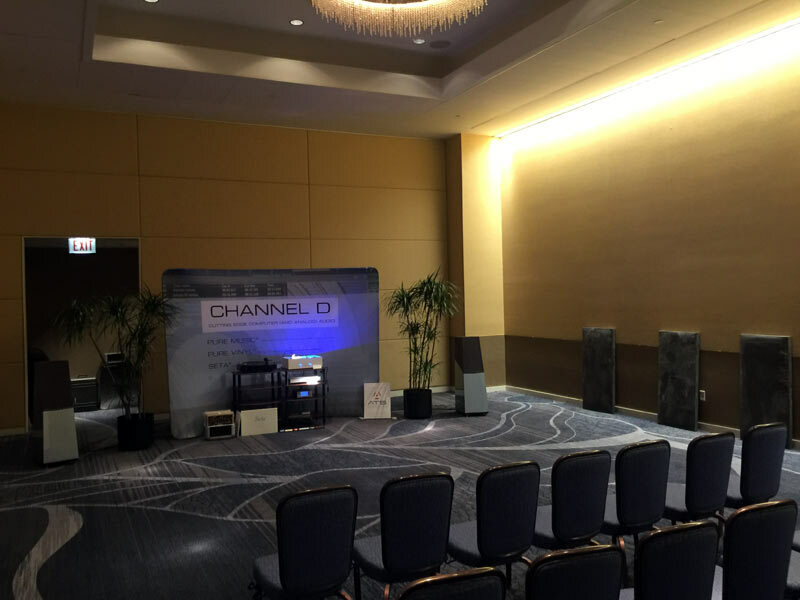 Our exhibit room audio system was the same high performance, tri-amped (panels/stereo woofers/stereo subwoofers) system we used at AXPONA (see April 2016 News post below for details). 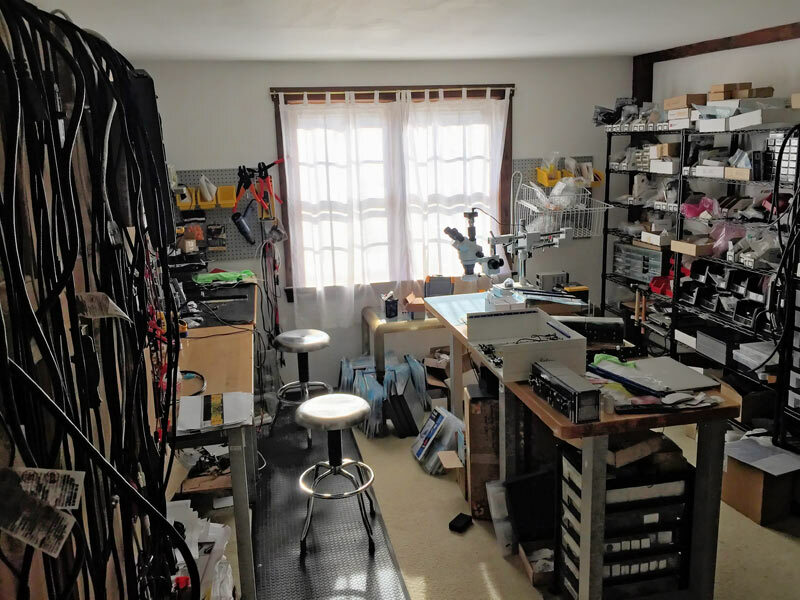 Taming the acoustics of this nearly-square room footprint with its unfavorable dimensional ratio (42 by 46 by 11 feet) was extremely challenging. 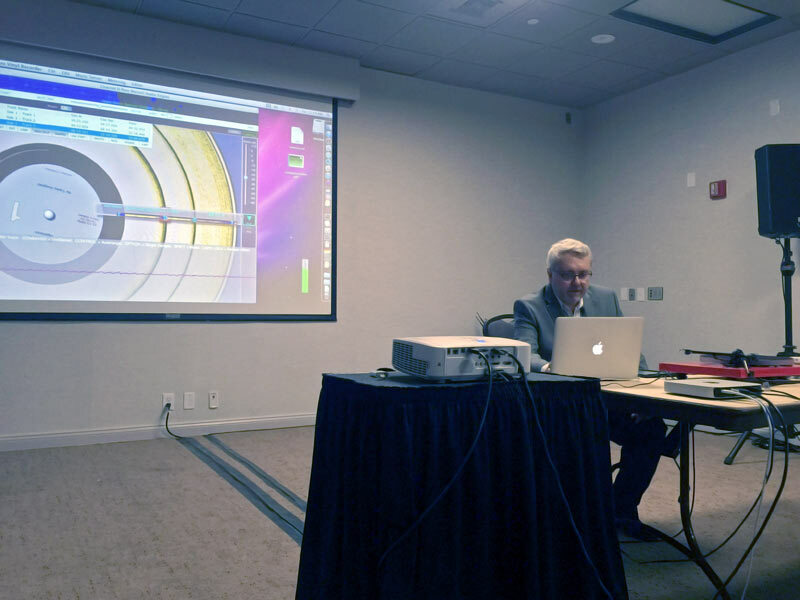 Aided by making careful acoustic measurements with Channel D's Mac the Scope software in swept-sine and third-octave-filtered pink noise modes, we spent over 8 hours determining optimal positions for the panels and woofers, before fine-tuning and voicing the system with music. 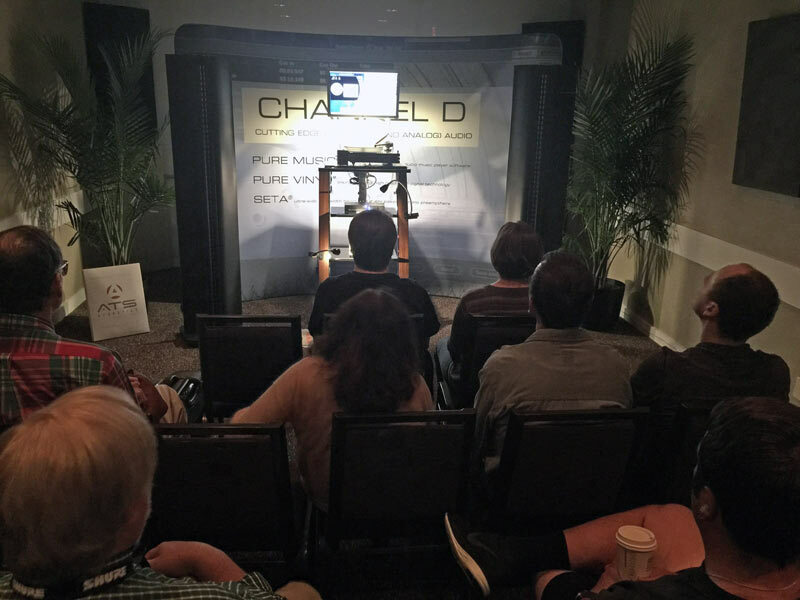 Using the adjustable time alignment feature of the Pure Music / Pure Vinyl crossover gave us the freedom to position the woofers for best uniformity of coverage (especially important in an exhibit room), slam / definition and frequency response, and to position the panels for best imaging. The bandwidth-limited (250 Hz and up) audio used to drive the panels was delayed 7.2 milliseconds relative to the main woofers, and the aggregate panel/woofer combination was delayed an additional 16.7 milliseconds relative to the subwoofers. 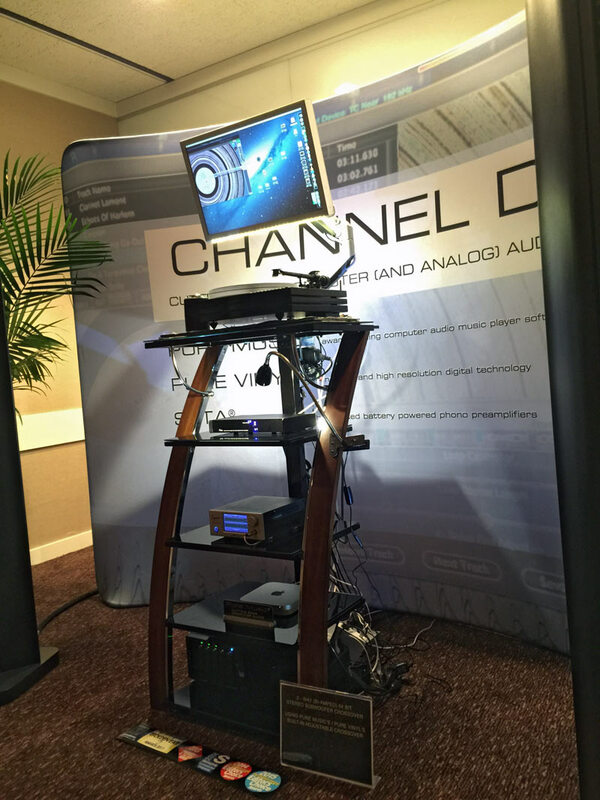 Time alignment for speaker positioning flexibility is impossible to realize in an all-analog multi-amped system because the necessary signal delays cannot be generated with analog circuitry. 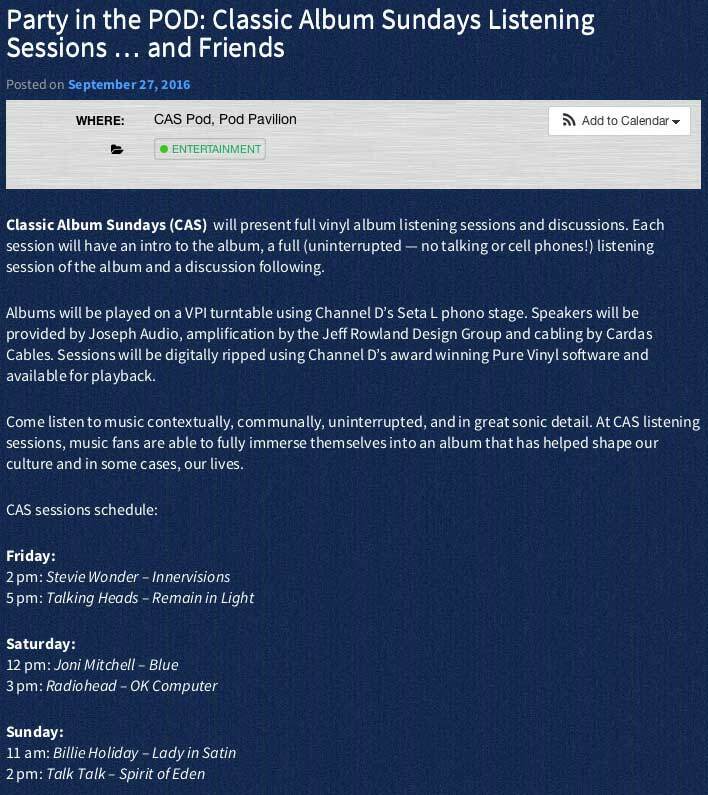 See you at Capital Audiofest next year! 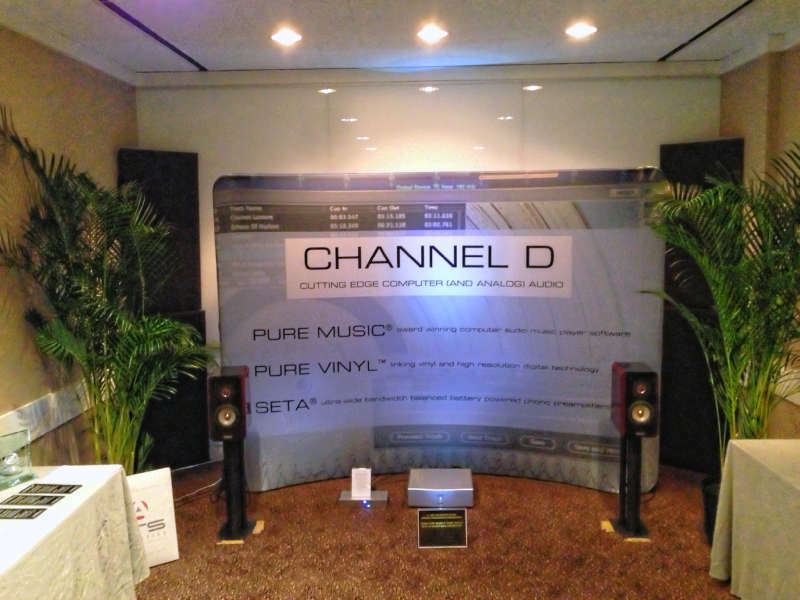 Channel D will be at Capital Audiofest - and Previewing Pure Vinyl 5! 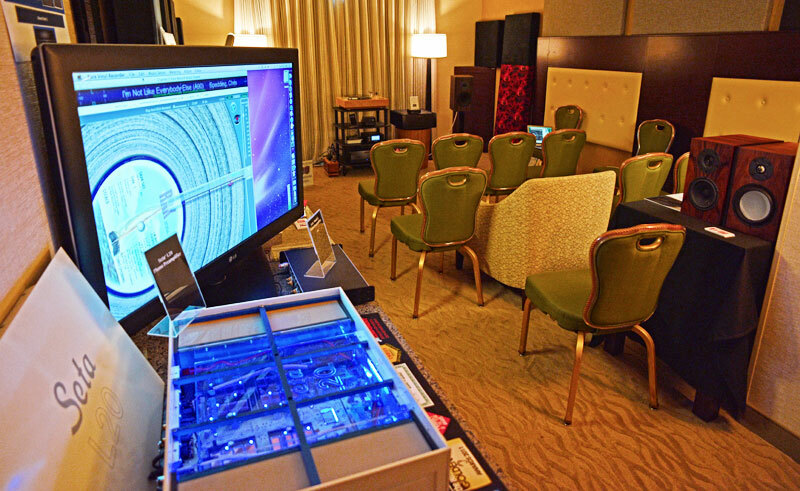 Come see us in the Regency Ballroom - we'll have the same tri-amped audio system we had at AXPONA, and will be giving our popular Vinyl Ripping Session seminar, 10:15 Saturday morning in the Auditorium. - No more typing in track names! Yes! - Improved Automatic Track Finder - even works without track time "hints"
Click to download issue (review starts on Page 74 - note - written in Polish). 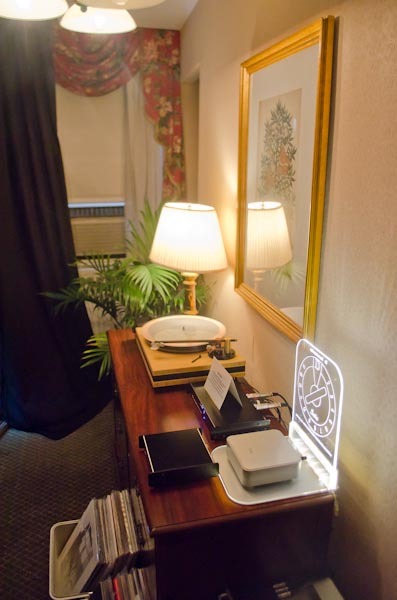 We omitted the analog 2-way electronic crossover of the Wisdom speakers (what we feel is their Achilles heel) and implemented the crossover using the built-in crossover feature in Pure Music / Pure Vinyl, in conjunction with 6 output channels from the Lynx Hilo DAC. This improved definition and removed the slight haze caused by the analog electronics and its multiple and complex op-amp based filters. 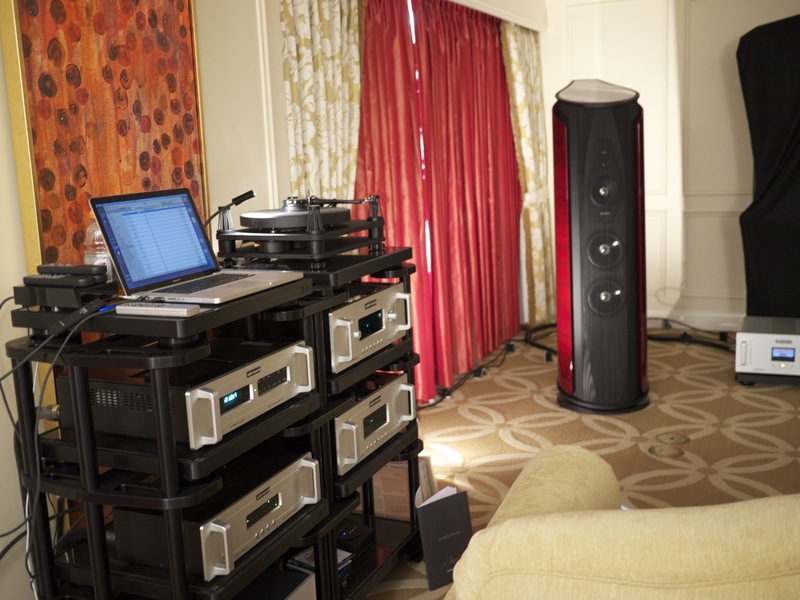 The system was tri-amped with a Hegel H20 power amplifier ($6000, 200 watts per channel) driving the panels and digital power amplifiers supplying 2000 watts per channel driving the bass and sub bass speakers (all located behind the backdrop). The bass was time-aligned to the panels using the digital delay feature in the Pure Music / Pure Vinyl crossover. 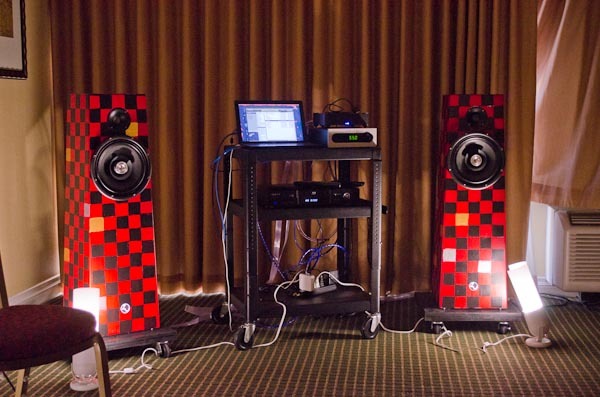 Therefore, the bass speakers could be positioned for best tonal uniformity and coverage, while the panels could be positioned for best imaging. (Those locations are almost never the same.) 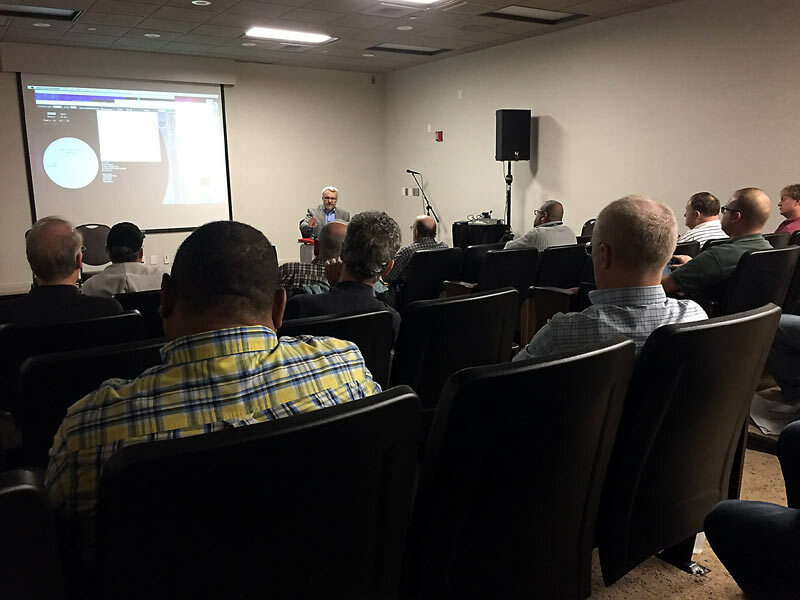 More than one group of attendees remarked something along the lines of "you realize that you are embarrassing the big guys?" 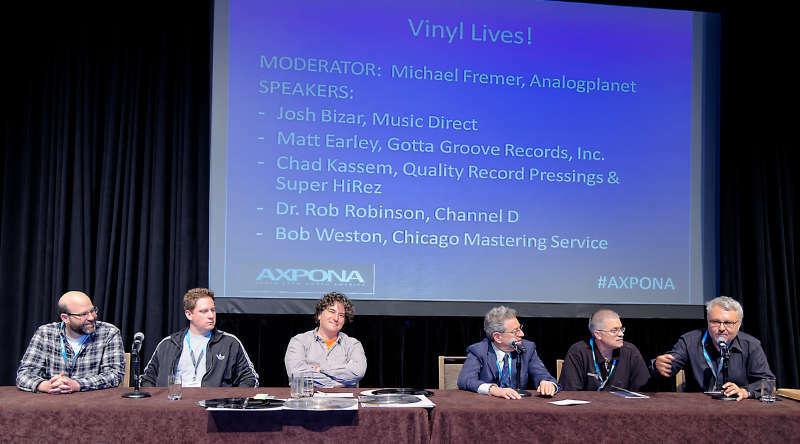 See you next year at AXPONA! 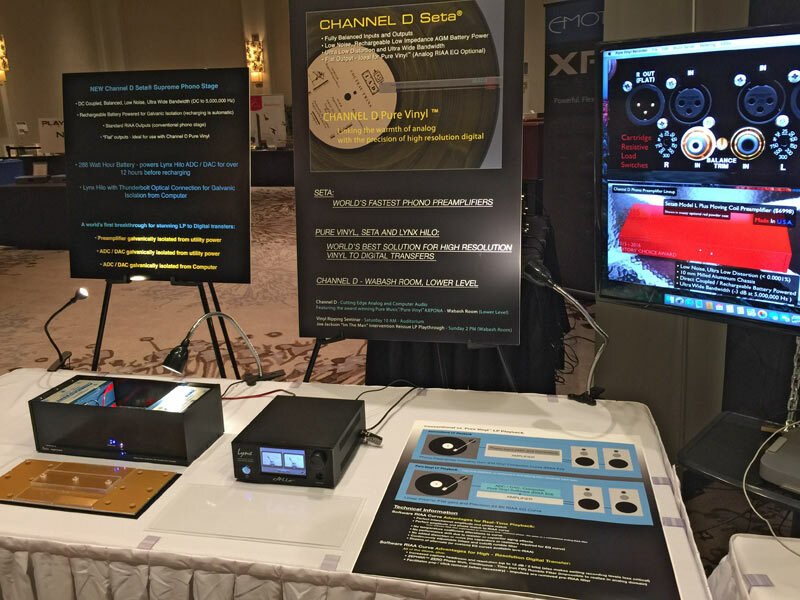 Be sure to visit our exhibit room at AXPONA 2016 (April 15 - 17, 2016). 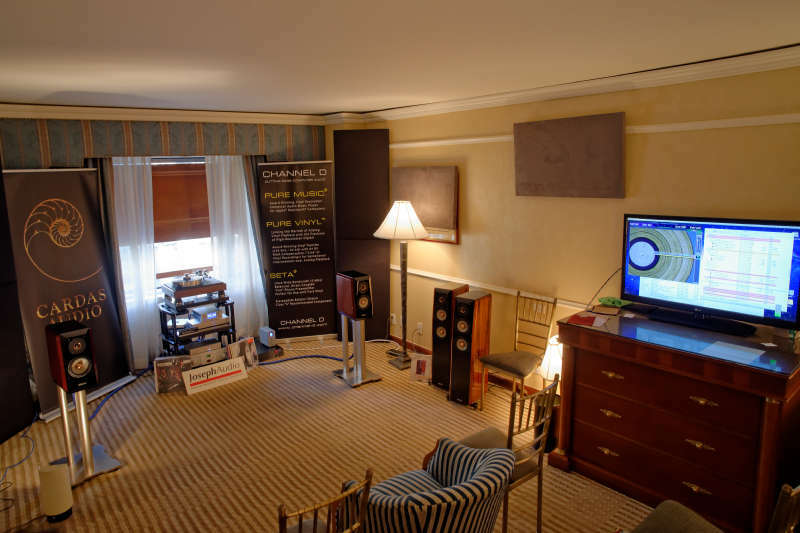 We'll be in the Wabash Room (lower level) with a very special audio system, and also occupying a place in the new Manufacturer's Showcase. Enjoy the Music's review of our Seta Piccola phono preamplifier: "Much more than a great phono preamp"
Pure Music Version 3 includes over 40 new features and performance enhancements. There have been extensive UI and responsiveness improvements under the hood resulting in greatly improved performance. 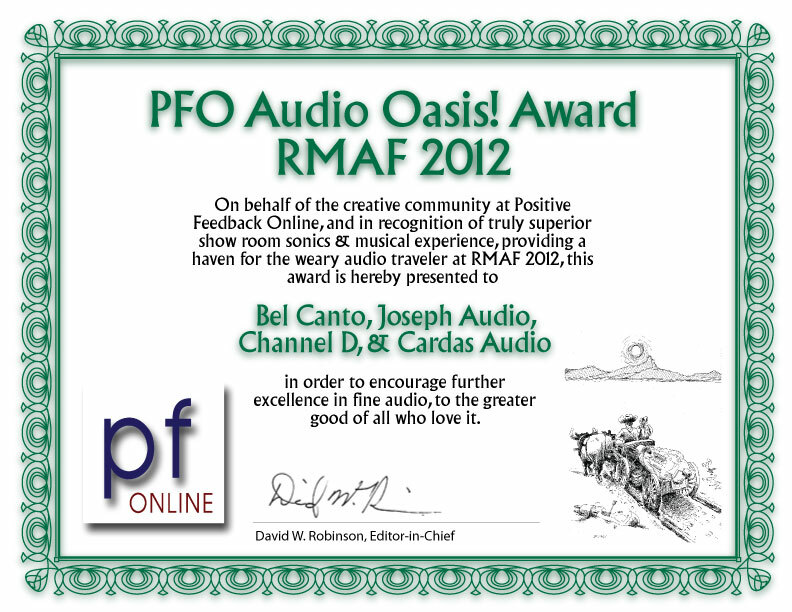 We are thrilled to say - this is the best Pure Music ever! "22nd of September 2015. My Lino Phono Preamp/192/24 ADC-DAC arrived yesterday. Disconnected my Prism Sound Orpheus and the Lino was plugged in to my system of Mac Mini, VPI Classic (balanced output) and low output ZYX R1000 Airy 3 MC cartridge. Some adjustment had to be done: load, gain and some other things but basically plug and play. "And what a relief. Now everything became quiet, much less system (almost dead quiet) and surface noise. 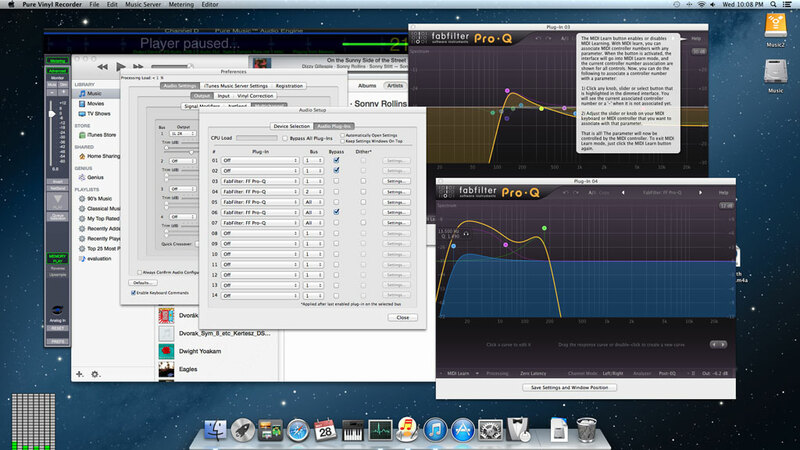 Soundstage increased and a more coherent sound appeared with no loss of resolution compared to the Prism. And this was straight from the box. "When you hear this you can tell the Lino is made for vinyl. 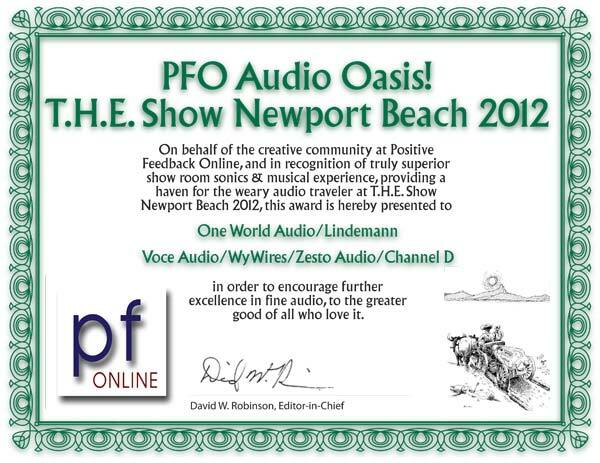 Prism Orpheus is a great sounding Sound Card even with vinyl but the Lino made a huge difference." 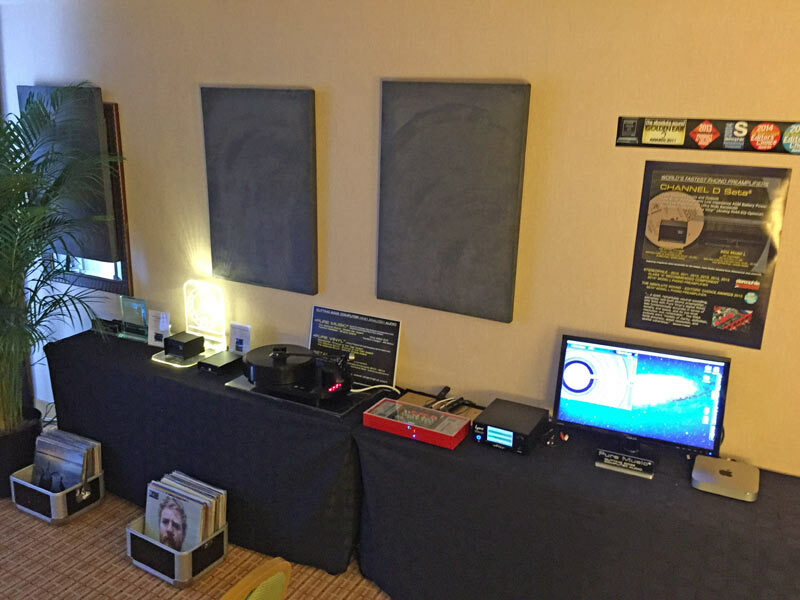 Our 10th time in a row exhibiting at Rocky Mountain Audio Fest (more than all of the other audiophile computer audio music player software companies combined)! 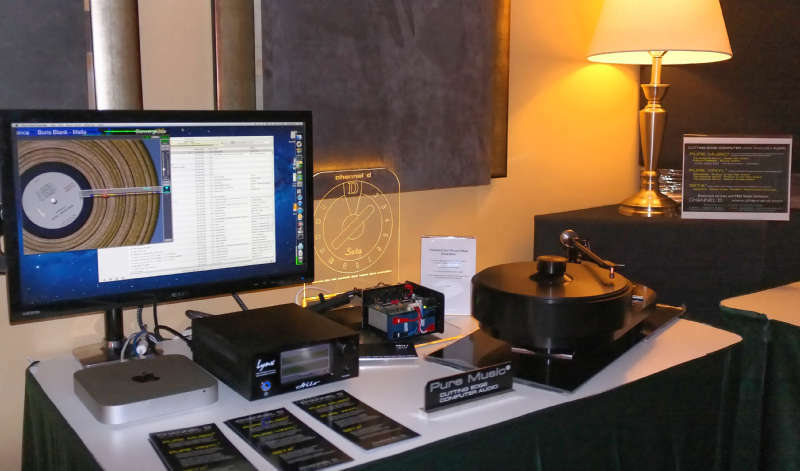 Stop by to say hello at Rocky Mountain Audio Fest. The 2.0.3 Update addresses performance issues with iTunes 12.1, an Unexpected Quit issue with Playthrough / Streamthrough, enhancements to Streamthrough, as well as including additional bug fixes and performance enhancements, and is recommended for all users. 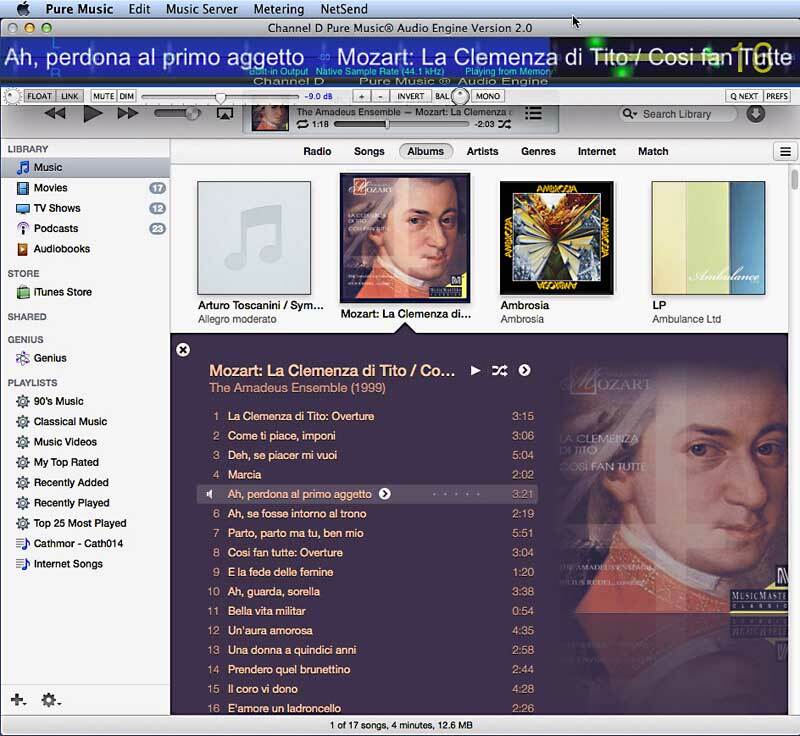 Streamthrough has been included with Pure Music for the last 4 years (making Pure Music the first computer audio software to offer this feature, by a considerable margin). However, Streamthrough has been enhanced and refined even further in Pure Music 2.0.3, making it the most advanced and automated such offering available. 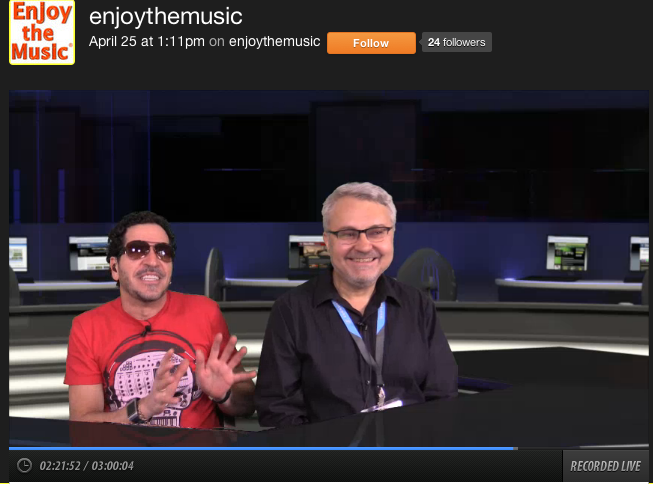 Streamthrough is fully integrated with Pure Music. There is no need to purchase or launch a separate application! 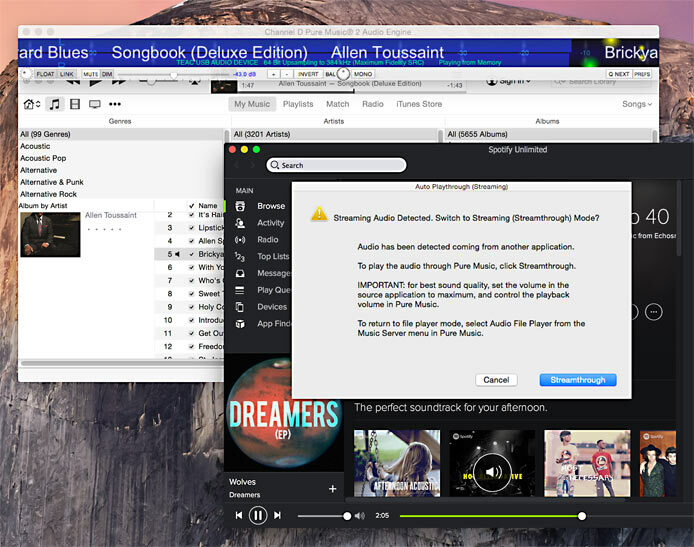 Even better, switching to Streamthrough is AUTOMATIC - if you play an Internet radio station in iTunes, or TIDAL, Qobuz, Spotify, YouTube, etc., the audio is "automagically" detected and switches Pure Music from file play to Streamthrough mode! In addition, Pure Music 2.0.3 includes improvements to address performance issues with iTunes 12.1, which was recently released by Apple. 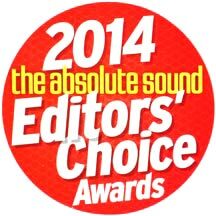 Pure Music chosen as one of Mac Edition Radio's The Best of 2014 Top Ten High-Resolution Audio and Musical Picks To Start The New Year! 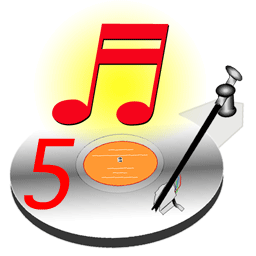 Mac Edition Radio's The Best of 2014 Top Ten High-Resolution Audio and Musical Picks To Start The New Year! 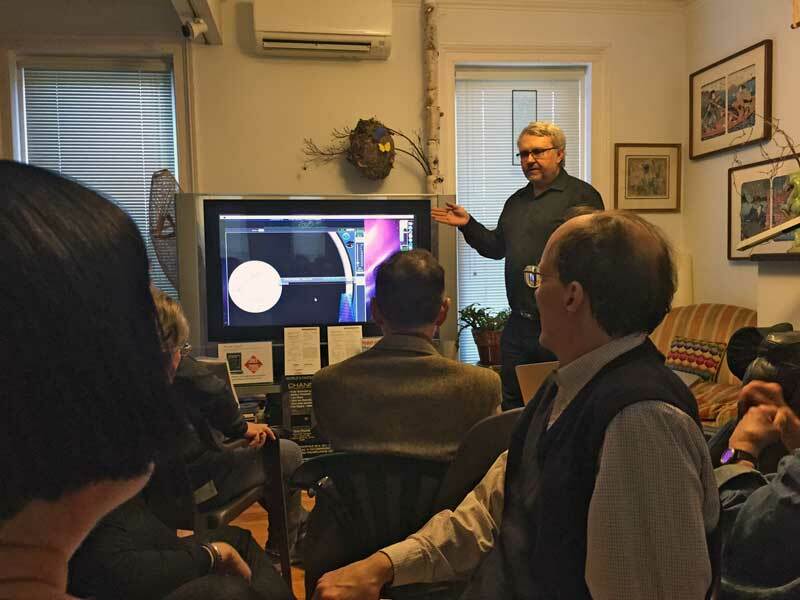 Channel D's Director of Engineering was invited to give a presentation on vinyl ripping to a packed house at the December meeting of the New York Audiophile Society. 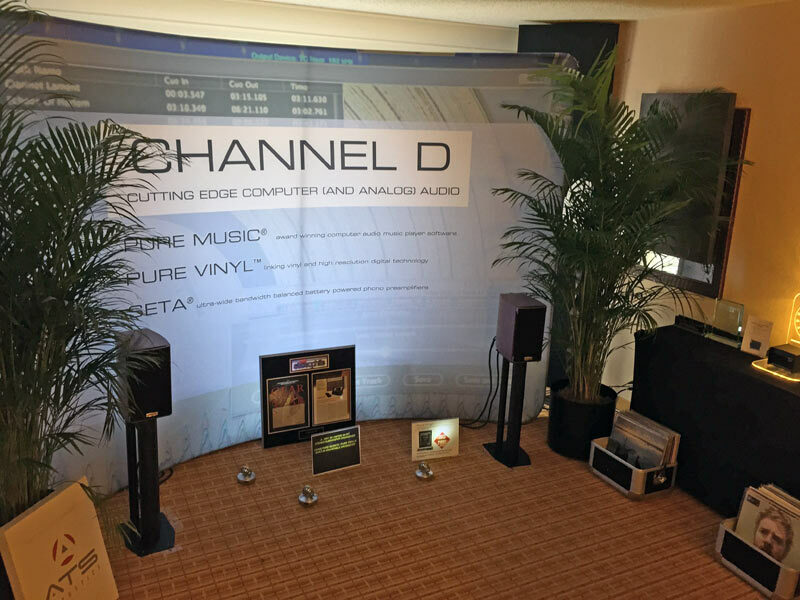 Besides our own exhibit room, Channel D Pure Music could be found in exhibits mounted by Wavelength Audio, Musical Surroundings, Hegel, Audioquest / Vandersteen, Joseph Audio, Spatial, Jeff Rowland Design, and others. Stereophile "The sound of the (24/192 vinyl) rips, played ... with RIAA equalization applied in the digital domain, was simply superb." 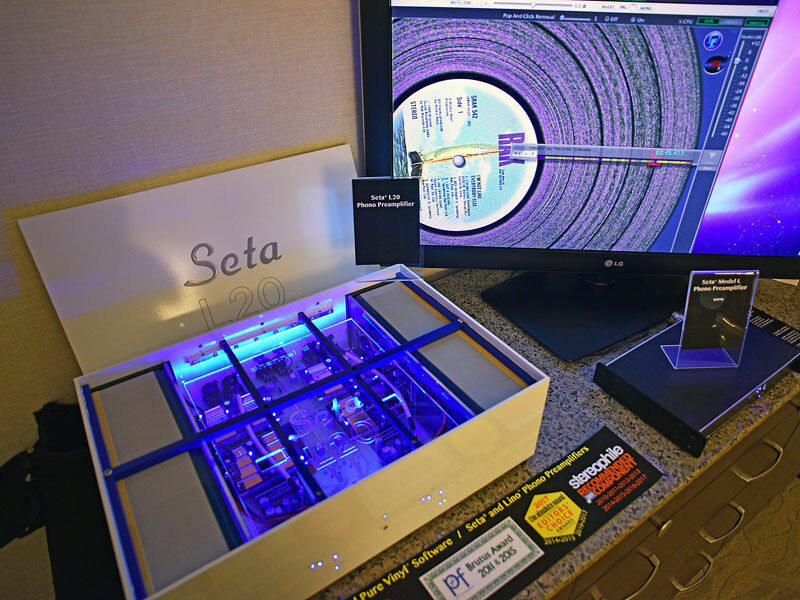 The optional hardware RIAA module is now available for the Seta Piccola. 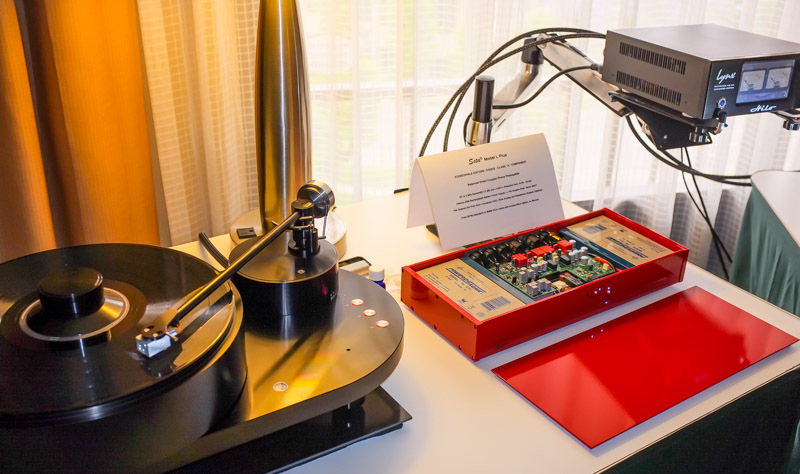 The price is $299 (must be ordered at the same time as the preamplifier). The specs include less than 0.003% THD 20 Hz to 20 kHz; RIAA curve accuracy of +/- 0.2 dB, 10 Hz - 40 kHz; and right / left channel RIAA matching of better than +/- 0.01 dB, 10 Hz - 40 kHz. 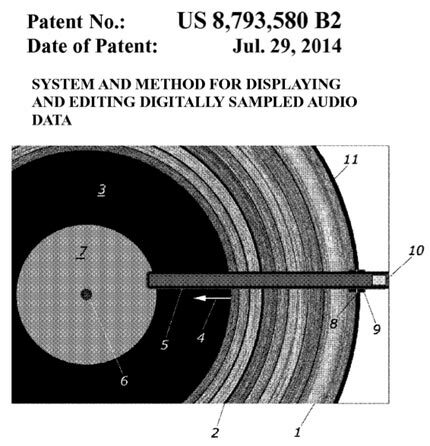 Channel D was granted US Patent #8,793,580 B2 for "SYSTEM AND METHOD FOR DISPLAYING AND EDITING DIGITALLY SAMPLED AUDIO DATA" - in other words, our novel invention for creation of Cue Guide images in Pure Vinyl, used for track editing. This follows our UK Patent #GB2454106. 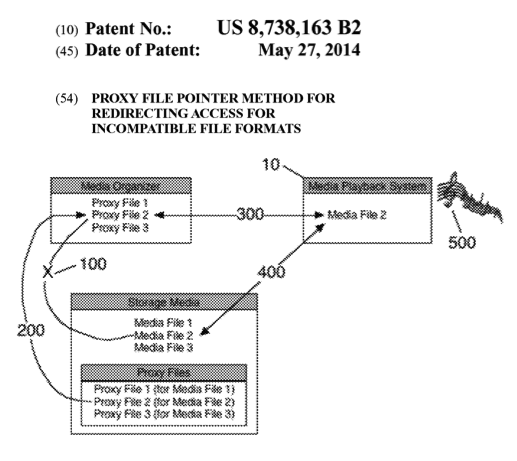 Channel D recently was granted US Patent #8,738,16 B2 for "PROXY FILE POINTER METHOD FOR REDIRECTING ACCESS FOR INCOMPATIBLE FILE FORMATS" - in other words, our novel invention and innovation permitting FLAC and DSD files to appear in Apple's iTunes. 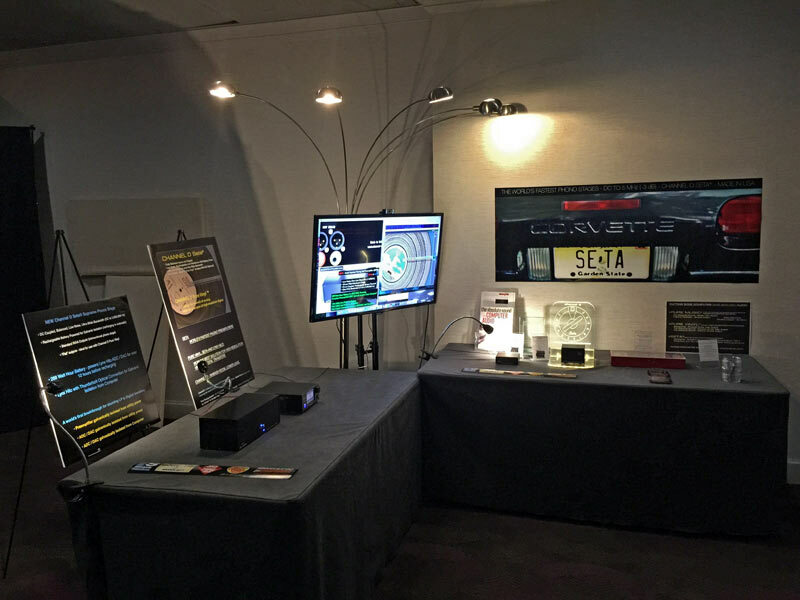 Many thanks to all of our Seta, Pure Music and Pure Vinyl users who were able to find us at the show (despite the show promoter's inexplicably omitting Channel D and our co-exhibitor Lynx Studio Technologies from the Show Guide's Index and Room Listings, and the room directory banners in the hotel lobbies)! 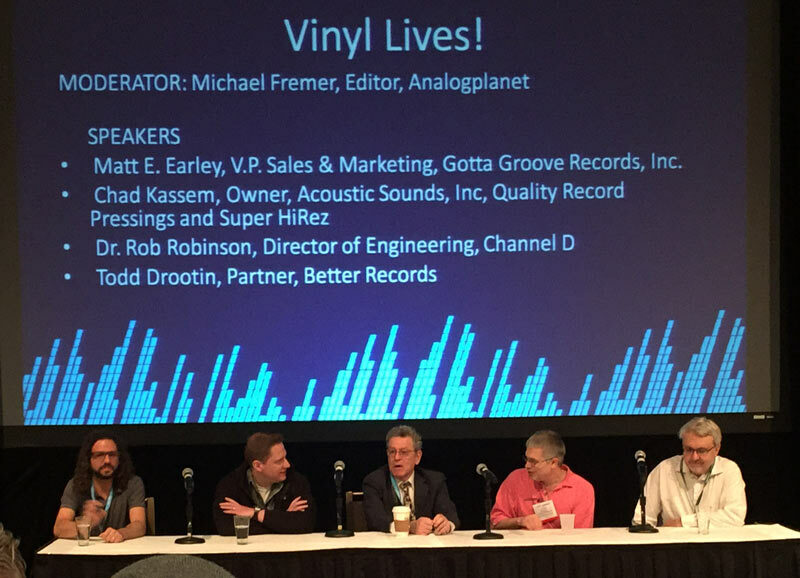 On Pure Vinyl's digital RIAA and crossover features, used with Pro-Q audio plug-in for room correction: "It's now been quite a few months, and it has not only met my expectations, but exceeded them... For most of my years in the-end audio, I was a "purist." 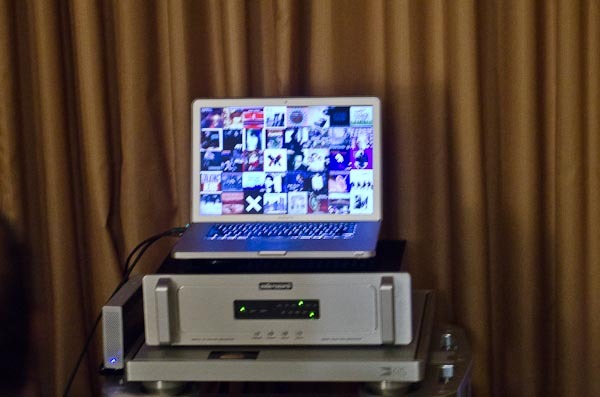 I believed that systems had to be as simple as possible, that only SET amps could provide musical satisfaction, and that CDs were at best, a poor substitute for vinyl. As time has gone by, and as I've experienced new things, I've had to shed many pre-conceived notions, and spit out quite a bit of Kool-Aid. 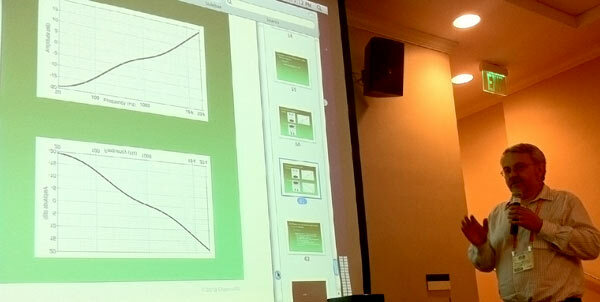 The use of digital processing, not just for room correction but also - heaven forbid-! 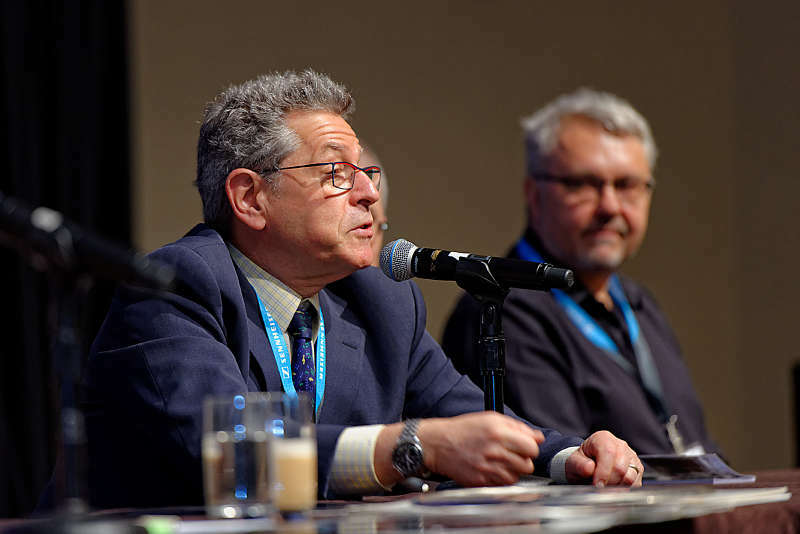 - for RIAA processing, has been the latest and perhaps most significant step." NEW! Pure Music 2 Released! Over 50 new features and performance enhancements in all, since the previous version! PLUS many more additional new features, improvements and bug fixes. FREE upgrade / download if you have purchased a Pure Music license in the last 15 months. Discounted upgrades are available for a limited time for previous users! Best Sound Award (Cost no Object) - "Best sound award goes to the Channel D/Lynx Hilo/Hegel/Joseph Audio Pulsar system in the "Wabash" room. 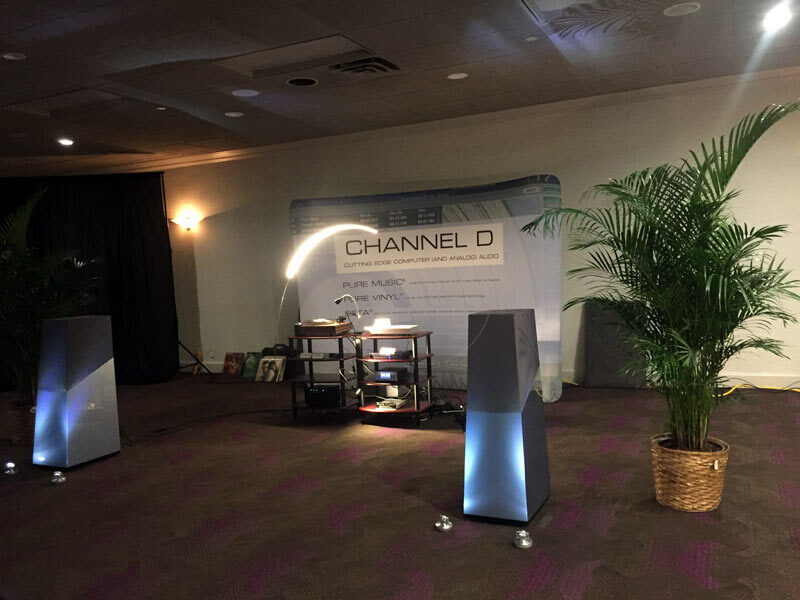 Using room correction, corner bass traps and sidewall absorbers from ATS, and precise speaker placement, Channel D was one of the few rooms to get accurate sound." Click for Show Report. 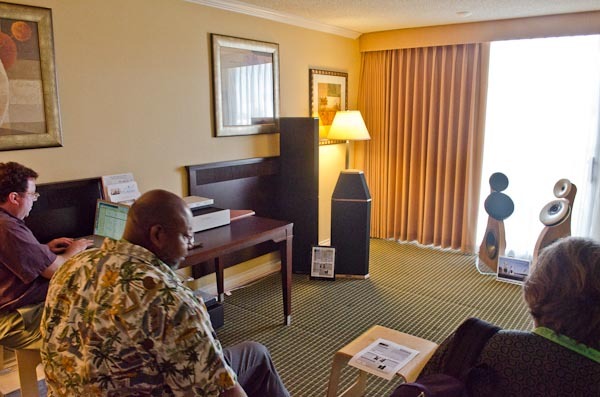 A bi-amped stereo subwoofer setup was needed to attain lifelike listening levels with bookshelf speakers in the large (16x27x10 foot) room. 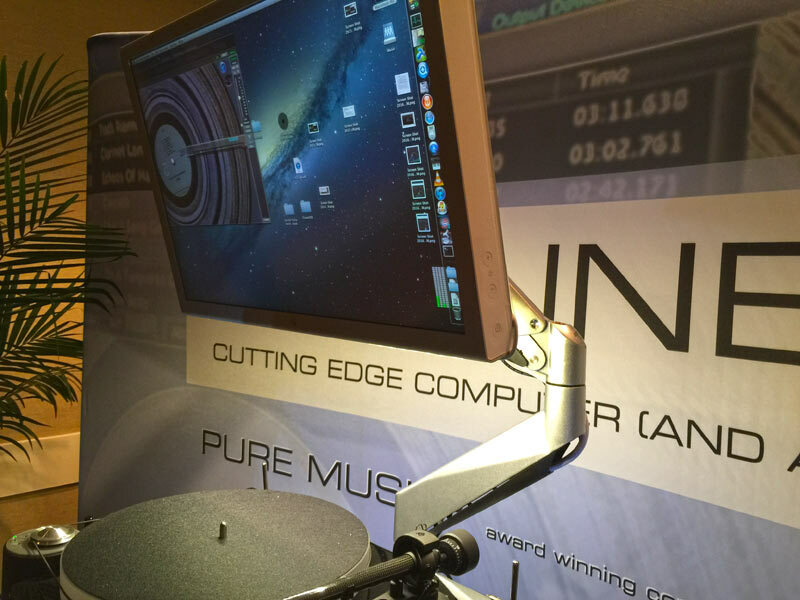 Accordingly, we used the built-in 64-bit adjustable crossover feature of the Pure Music/Pure Vinyl software. 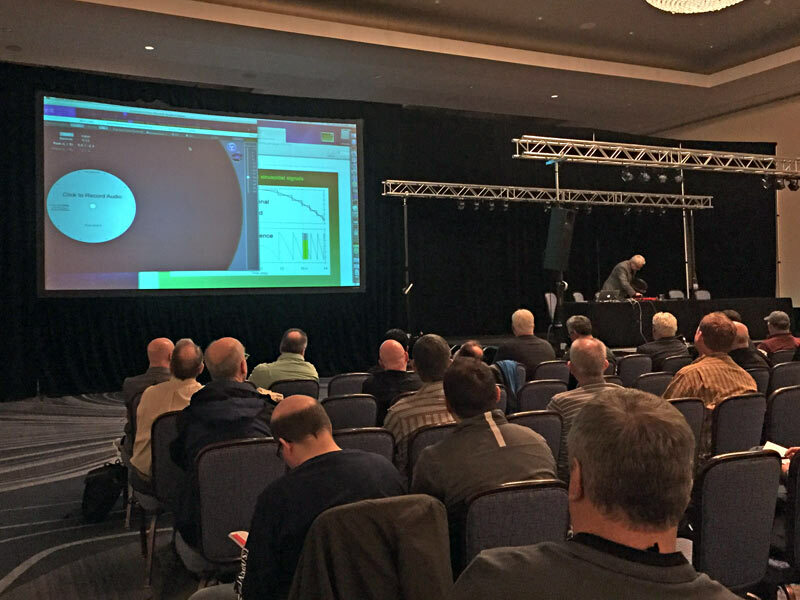 Room correction consisted only of bass absorber traps and wall panels from ATS Acoustics, in conjunction with painstaking optimization of the positions - to within less than an inch - of subwoofers and main speakers (aided by Channel D's Mac the Scope measurement software). 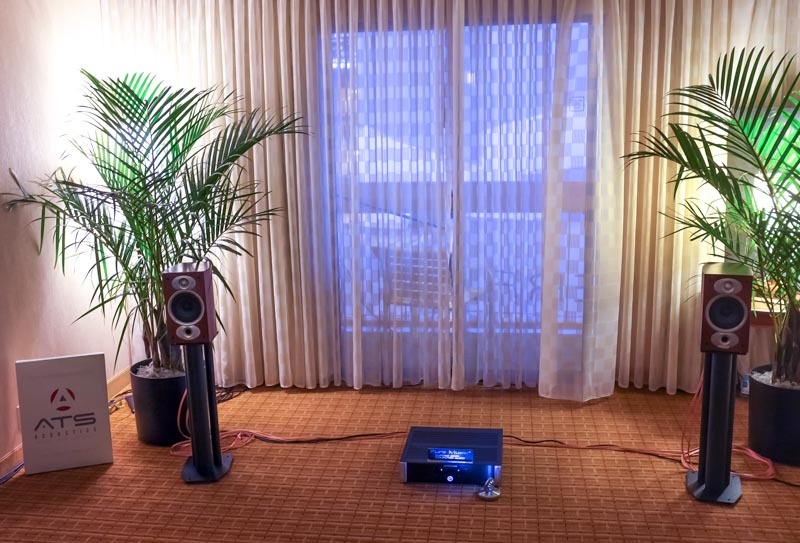 The crossover used four analog outputs from the Lynx Hilo DAC: two for the Pulsar bookshelf speakers and two for the subs. A second stereo amplifier was used to drive the subs. 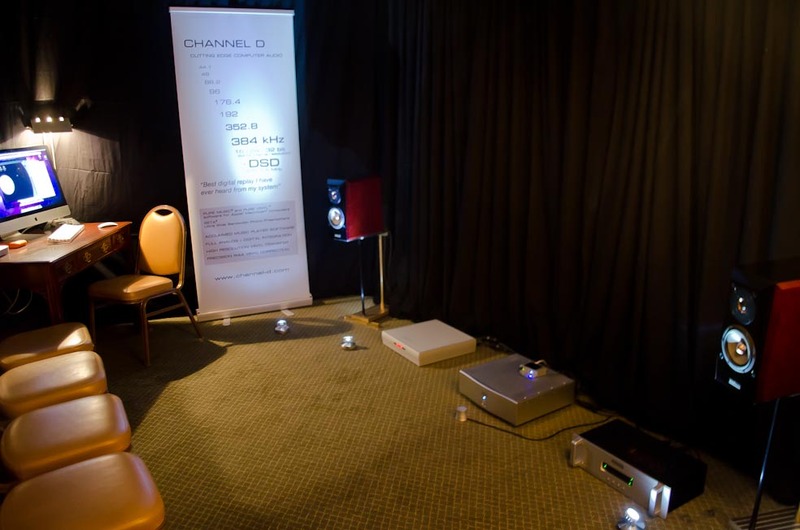 The subs, which were positioned along the back wall behind the banner, also were time-aligned by delaying the main speakers 2.95 milliseconds using the time alignment feature of Pure Music/Pure Vinyl. 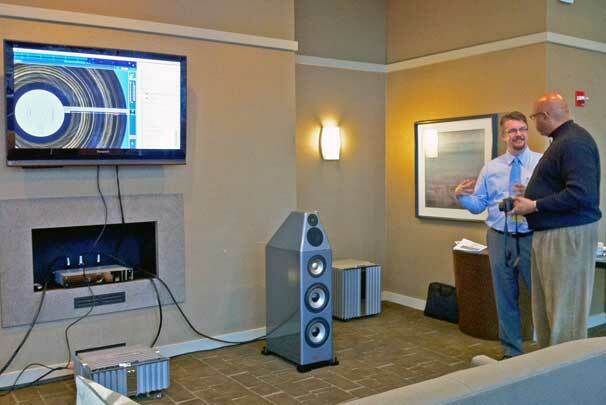 Time alignment is a critical but often overlooked aspect of integrating subwoofers into an audio system and is needed to insure that the sounds from the subs and the main speakers arrive at the listening position(s) simultaneously, essential for optimum smoothness, "slam," and definition. Pure Vinyl Version 4 Released! 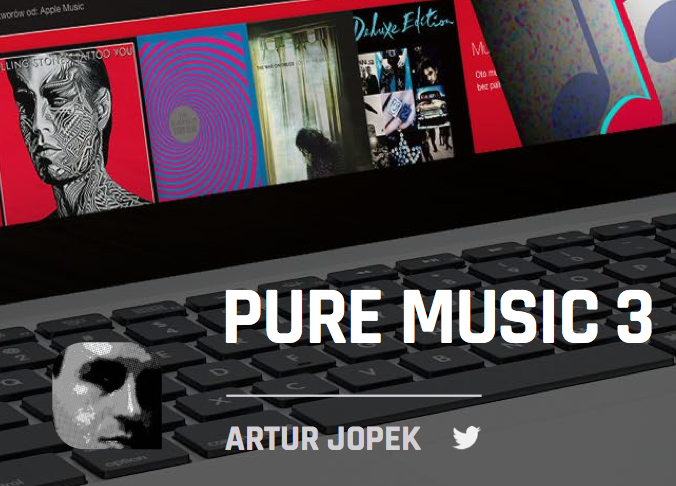 Includes a PREVIEW of the forthcoming Pure Music 2! Over 50 new features and performance enhancements in all! FREE Update if you purchased a Pure Vinyl license in the last 14 months. Includes internal hint to Energy Saver API to not allow App Nap, which caused playback to pause under Mavericks (10.9.1 or later) when the monitor sleeps. 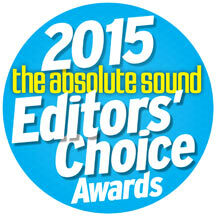 Channel D Pure Vinyl wins Editors' Choice Award from The Absolute Sound! Click for video Note: reposted February 2016, addressing copyright holder concern. Just joking! We have never exhibited at Las Vegas (and don't plan on it). 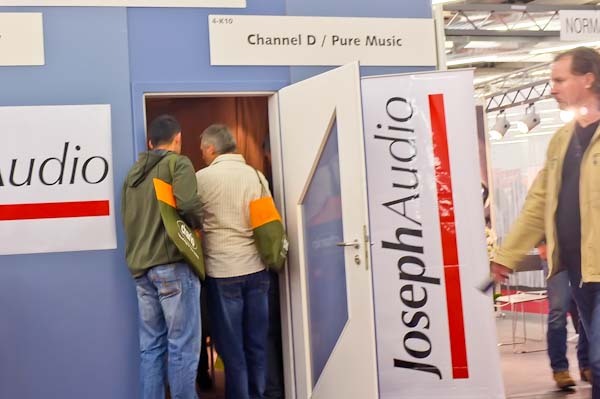 It's a bad time of the year for a trade show - and just as well, because we are working very hard on updates to our Pure Vinyl and Pure Music products (and they will be well worth the wait)! 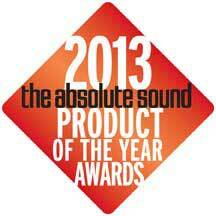 Channel D Pure Vinyl wins Product of the Year Award from The Absolute Sound! 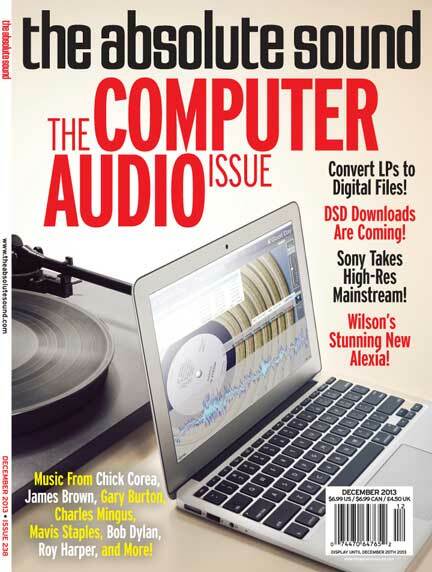 Channel D Pure Vinyl Featured on the Cover of the December 2013 issue of The Absolute Sound Magazine! 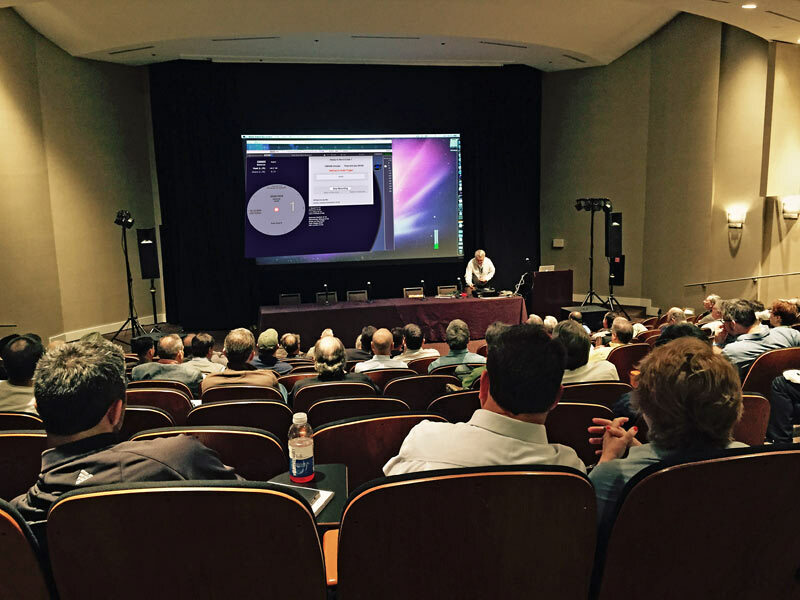 We have staged more live-demo exhibit rooms at RMAF than all other computer audio software companies combined. 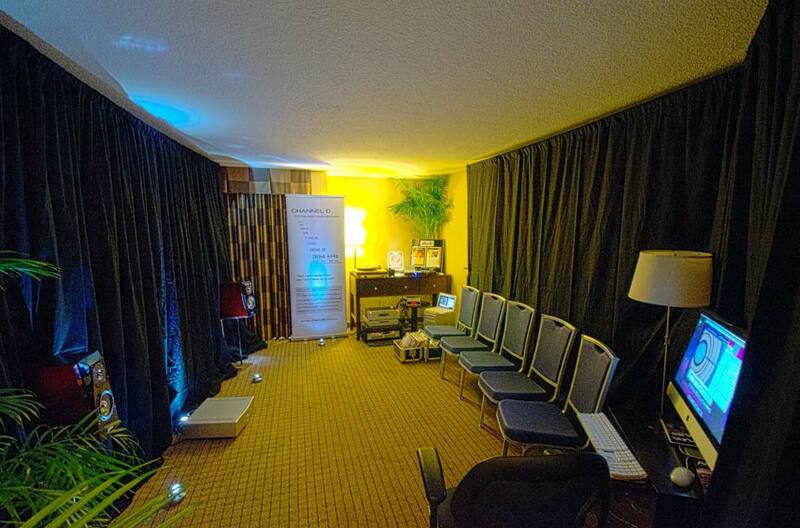 And this year, we even ran two separate exhibits - a high end system in Room 582, and a "budget" system in Room 586. THANKS (yet) AGAIN to all of the Pure Music and Pure Vinyl users who stopped in to say hello!!! 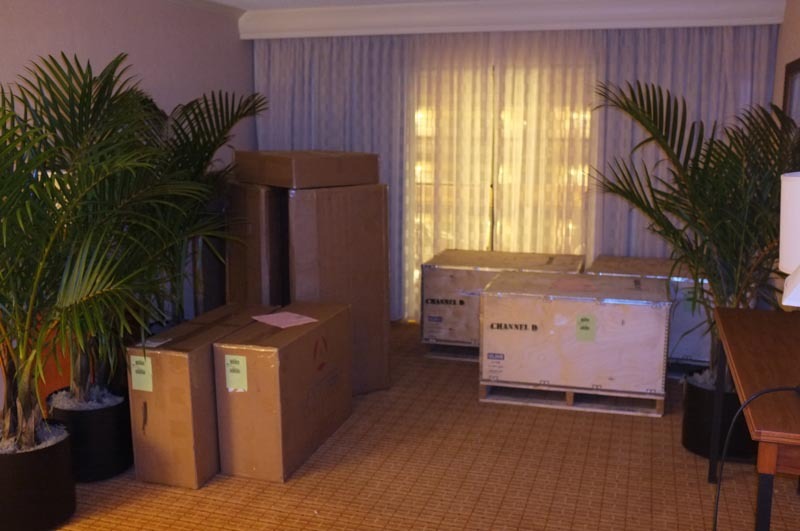 Another successful RMAF is now history... Channel D equipment all packed up, ready to go home! The review also includes a nice discussion about digital volume controls. 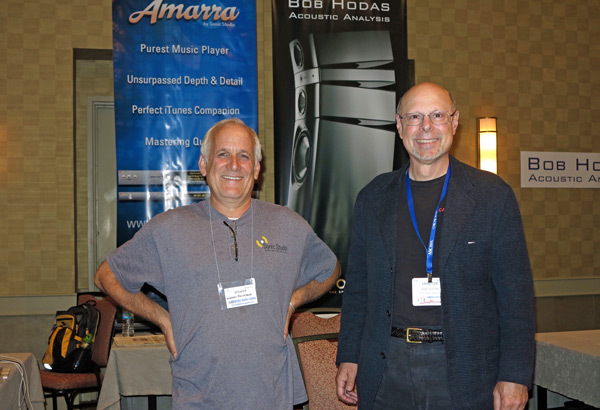 Check out the Amarra banner from the recent California Audio Show. Thanks Amarra! 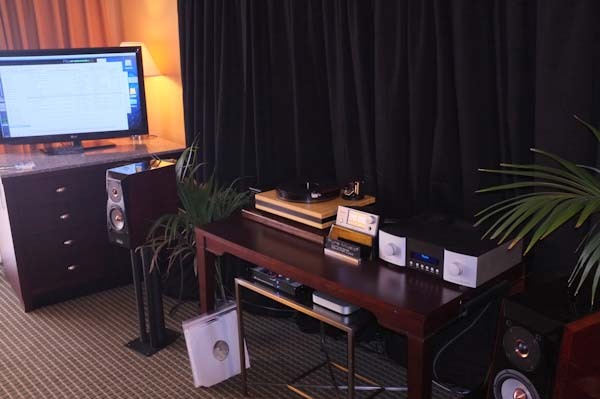 THANKS AGAIN to all of the Pure Music and Pure Vinyl users who stopped in to say hello! 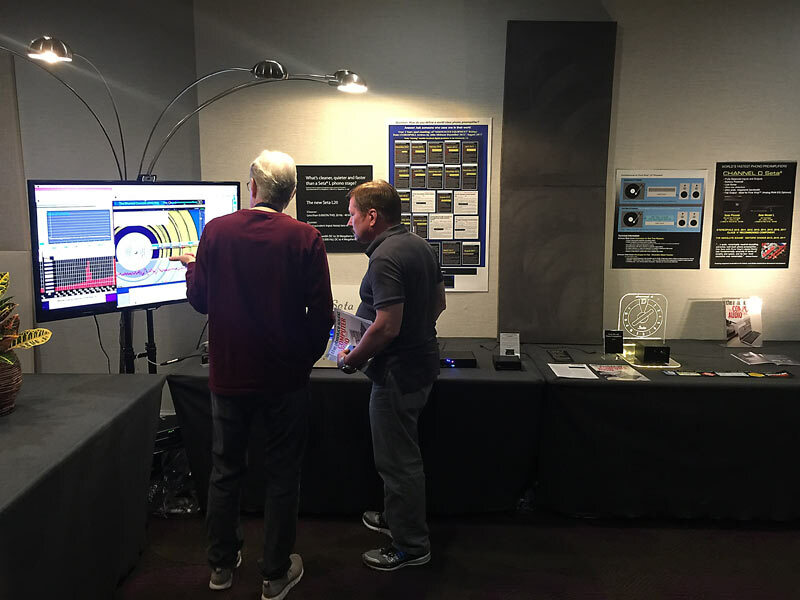 "ACTIVE SPEAKERS WITH PURE MUSIC AND FABFILTER PRO-Q: A PRIMER"
THANKS to all of the Pure Music and Pure Vinyl users who stopped in to say hello! 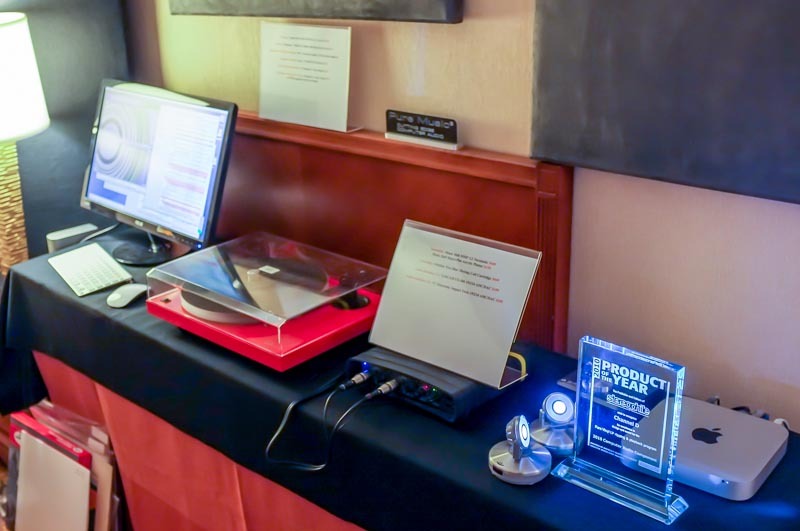 Special thanks to Musical Surroundings for providing the AMG turntable, Merrill Audio for providing the Veritas power amplifiers, ATS Acoustics for providing the room treatments, and Audioquest for balanced interconnects. 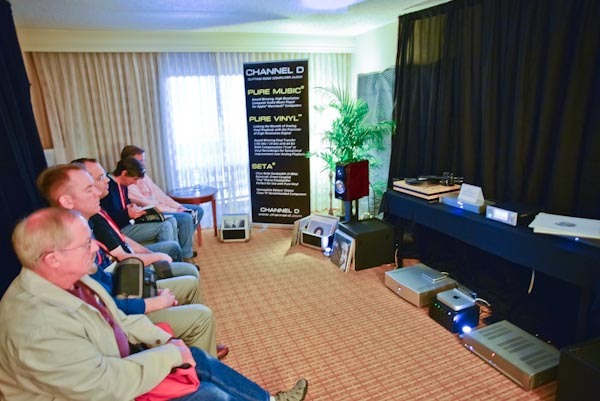 THANKS to our East Coast - based Pure Music and Pure Vinyl users who stopped in to say hello! 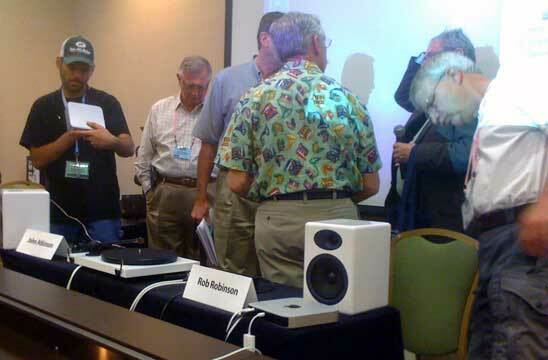 that made the trip to the first audio expo in Chitown in over 14 years, and stopped in to say hello! Please see the Pure Music Support page on our website for up to date information. 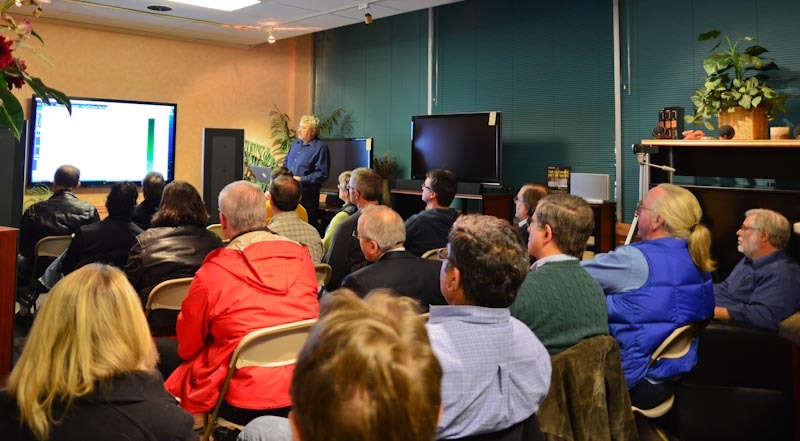 Channel D's Rob Robinson was invited to give a presentation on Computer Audio at Audiolab, a long-established audio dealer located in Fairless Hills, Pennsylvania. 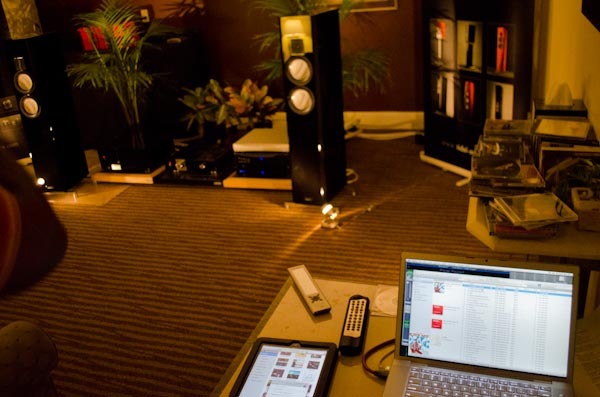 A full house of audiophiles responded to the invitations for the evening of November 28. 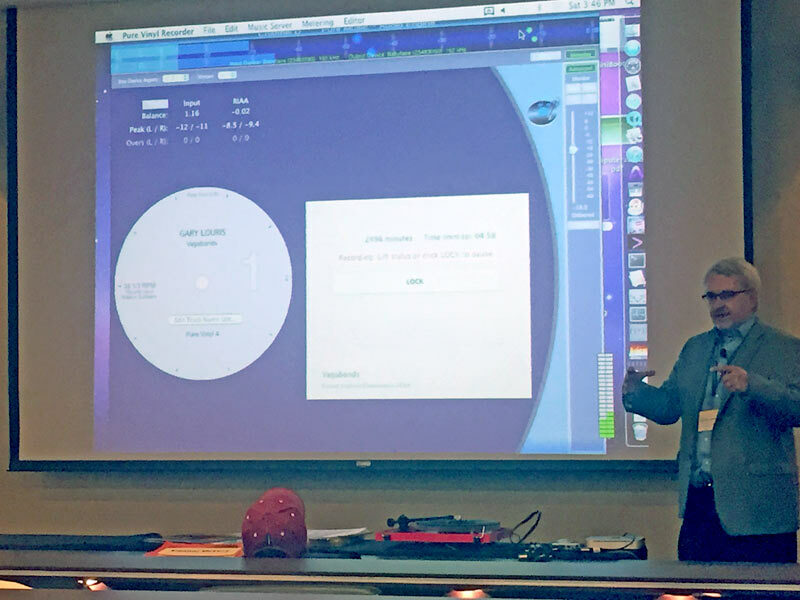 Everything from the basics of high resolution downloads and transferring CDs to a computer to DSD playback and vinyl transfer to high resolution digital files was covered for this very attentive audience. The latest free Pure Music update, version 1.88, has been posted. We have decided to postpone the 1.9 release for additional testing of new features which are not included in 1.88, which was the version frozen at the time Pure Vinyl 3.1 was completed (and was incorporated in Pure Vinyl 3.1). In the interim, Pure Music 1.88 has more than two dozen new features and performance enhancements compared to Pure Music 1.86. A complete list of changes is provided in the Release Notes in the User's Guide included with the update. Additional, significant user-requested feature enhancements are coming in Pure Music 1.9, which we anticipate will be available by mid - December. We have already ordered fully spec'd Quad Core i7 2.6 GHz Mac Mini with the Fusion hybrid internal HD and bare bones Dual Core i5 Mac Mini configurations for testing, and will update our Getting Started with Computer Audio web page accordingly... to be followed with information on the other new computers, when available. 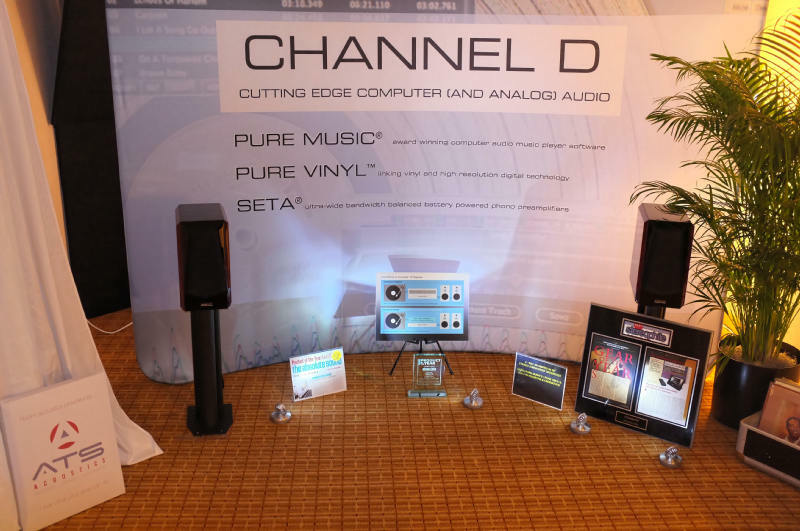 Channel D will introduce their new Seta Plus Phono Preamplifer and Seta DAC Buffer products at the 2012 Rocky Mountain Audio Fest, October 12-14, in Exhibit Room 482. 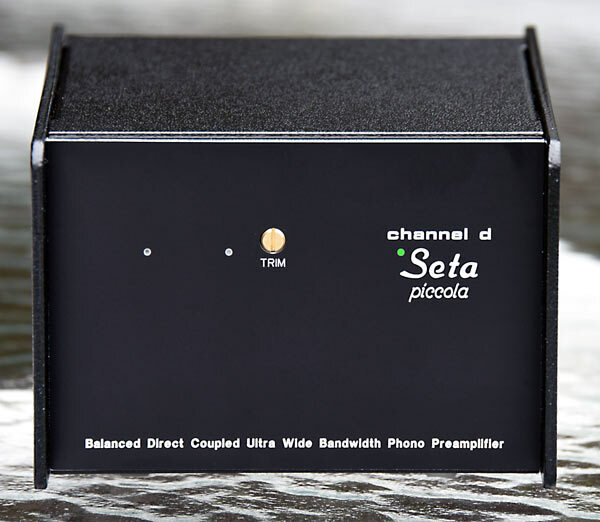 - The new Seta Plus Phono Preamplifier represents the continued evolution of Channel D's ground-breaking ultra wide bandwidth Seta "flat" phono preamplifier. The Seta Plus includes an updated, ultra low impedance, low noise rechargeable internal AGM battery power supply based on the original Seta phono preamplifier design, delivering superb transparency, detail and three-dimensionality for vinyl playback, a key benefit of the Seta's ultra wide bandwidth battery powered design. An optional, high quality headphone output is available. 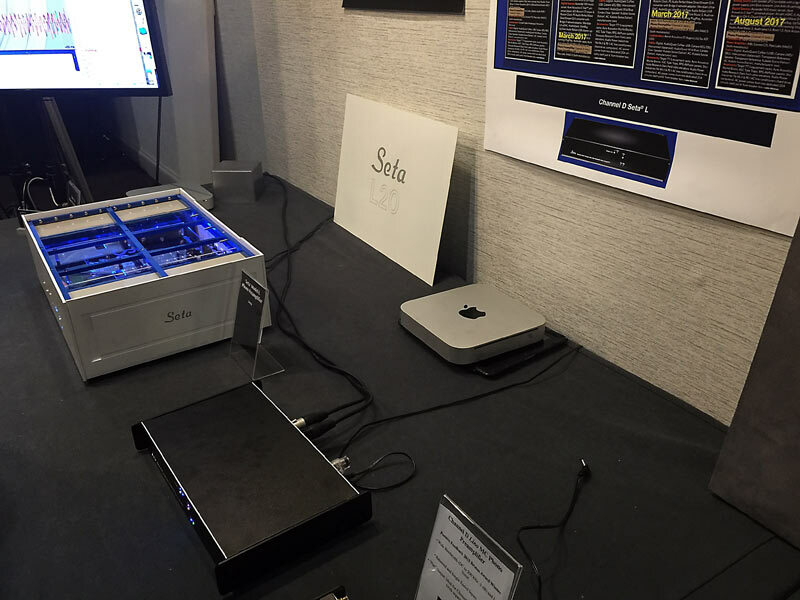 - The new Seta DAC Buffer solves a critical problem with today's Computer Audio that occurs when driving power amplifiers directly with the output of a DAC: setting the proper system gain structure. 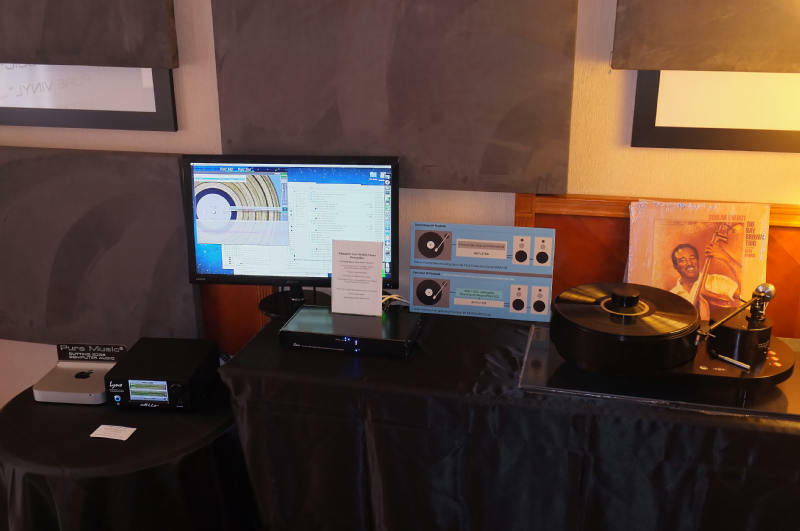 The Seta DAC Buffer provides a sonically transparent, analog way of adjusting the attenuation of any DAC's output (in 6 dB steps from -6 to -30 dB), permitting using the DAC or computer playback software's digital volume control in its optimum sweet spot (-10 to 0 dBFS). Unlike passive signal attenuators which would be used for a similar purpose, the high (2 megohm) input impedance of the DAC Buffer insures that electronic loading of the DAC's output is kept to a minimum, while providing a sonically transparent, ultra wide bandwidth (DC - 12 MHz, -3 dB) and low (20 ohms) output impedance for driving any power amplifier load or long interconnect run without adding noise or distortion. The net effect is one of stunningly deeper, more well controlled bass with greater impact plus lower listening fatigue and improved ease of presentation over the entire audio frequency range. For full information, please see the news release. 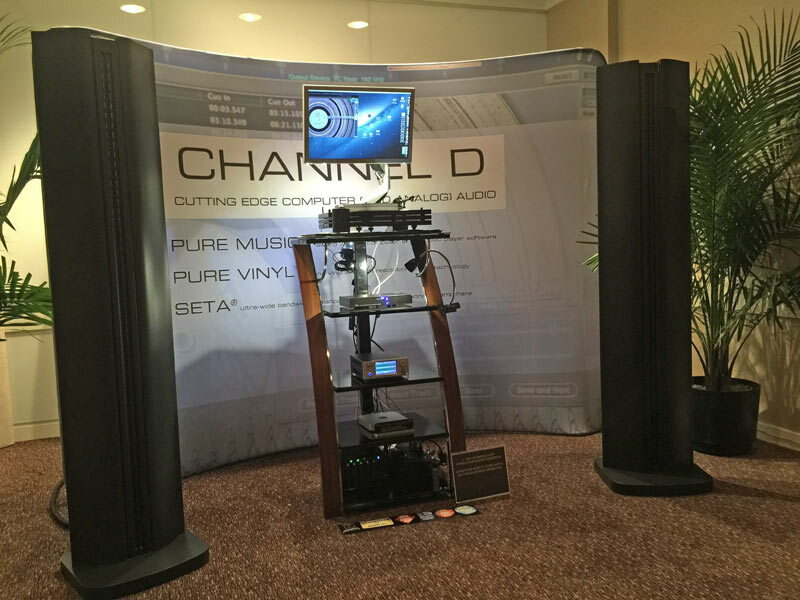 Channel D will be demonstrating major new updates to their award winning Pure Vinyl software for making high resolution digital transfers of analog sources and Pure Music digital music player software at the 2012 Rocky Mountain Audio Fest, October 12-14, in Exhibit Room 482. 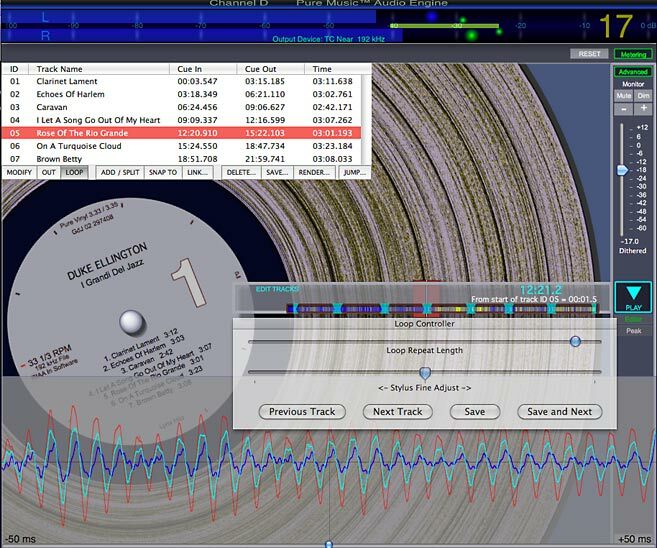 - Pure Vinyl 3.1 represents a significant update including performance and usability enhancements including new easy to use Jog and Insert Track controls for editing and splitting LP recordings into individual tracks. Pure Vinyl 3.1 will be released on October 23, 2012. - Pure Music 1.9 includes over two dozen performance enhancements and new features. Pure Music 1.9 will be released on October 30, 2012. Both updates will be free for all users. 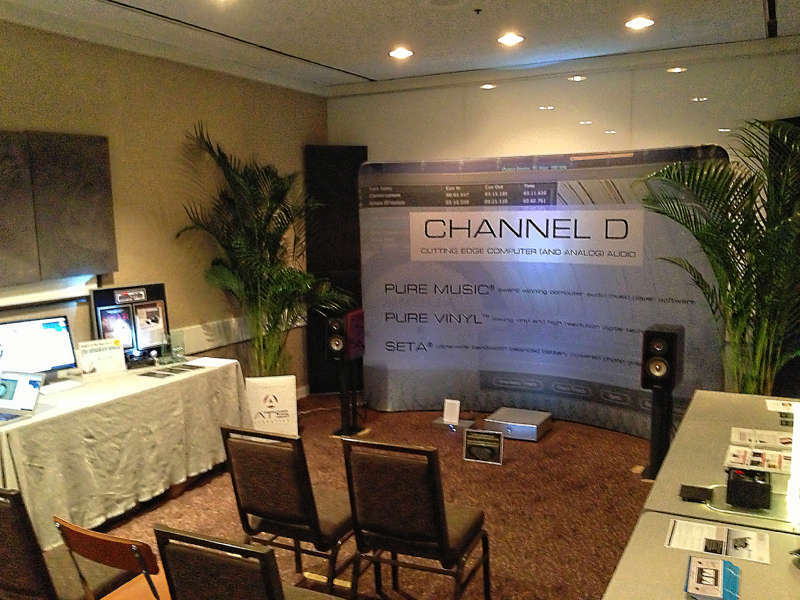 Be sure to visit Channel D's room at the 2012 Rocky Mountain Audio Fest (Marriott Atrium, Exhibit Room 482). 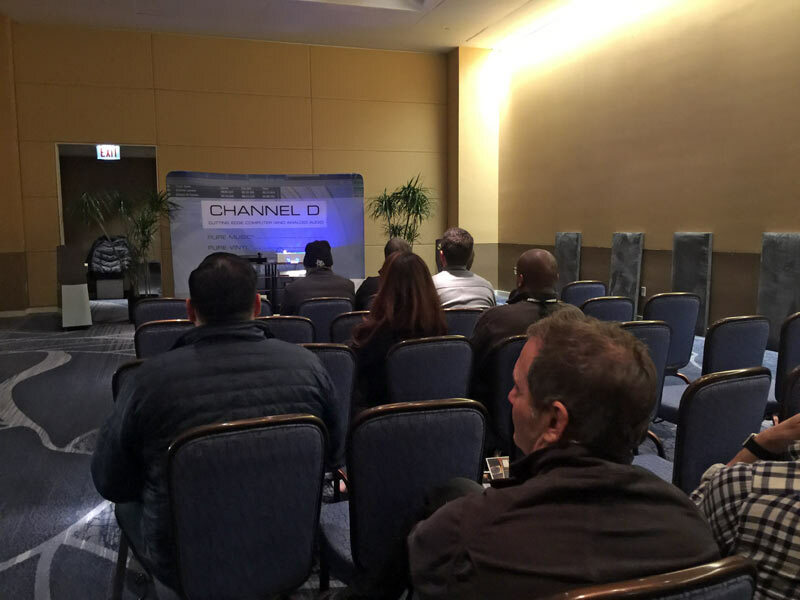 Audiostream's Michael Lavorgna poses ten questions to audio player software manufacturers, including Channel D.
Media Player Q&A: Q1 Should We Replace iTunes? 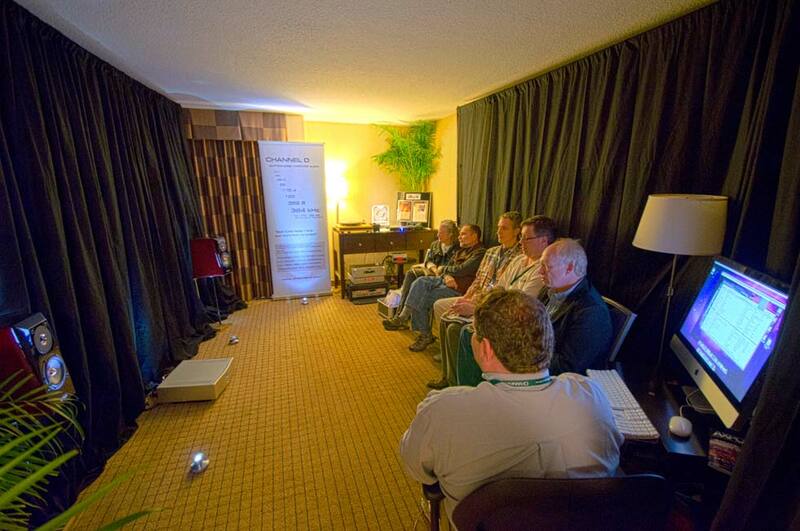 Media Player Q&A: Q2 What are your product's most important features? 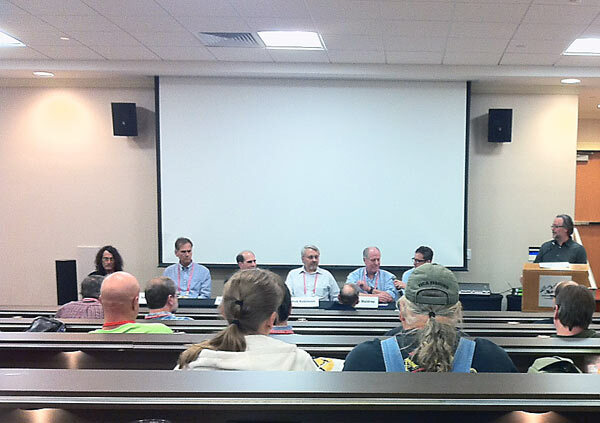 Media Player Q&A: Q3 What features of your product are underutilized, under appreciated, or just plain misunderstood? 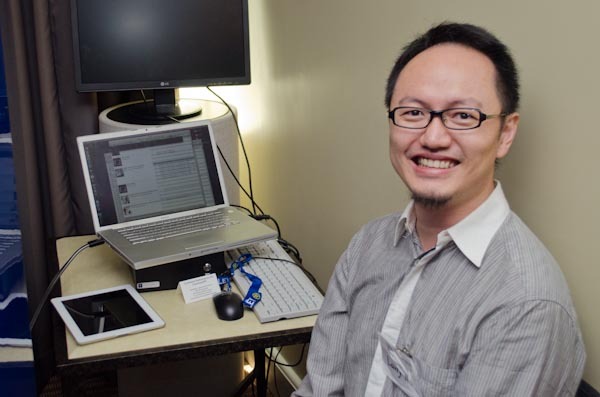 Media Player Q&A: Q4 What makes one media player sound different from another? Media Player Q&A: Q5 Is there a best method of connecting to a DAC? USB, Toslink, Coax? 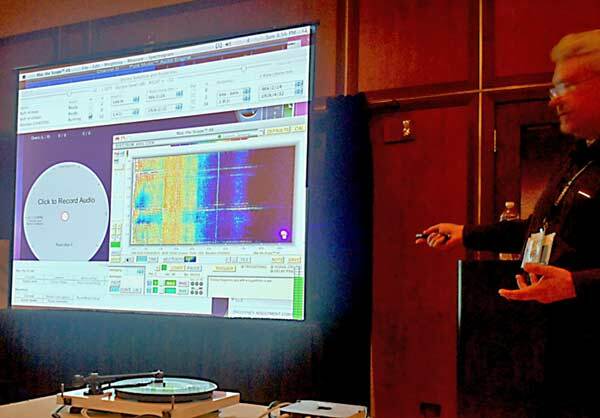 Media Player Q&A: Q6 Is it more beneficial to handle upsampling in a media player or in a DAC? 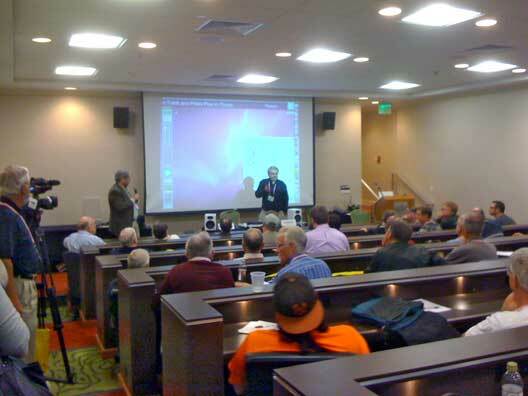 Media Player Q&A: Q7 Are there any special considerations people with large music libraries need to address? 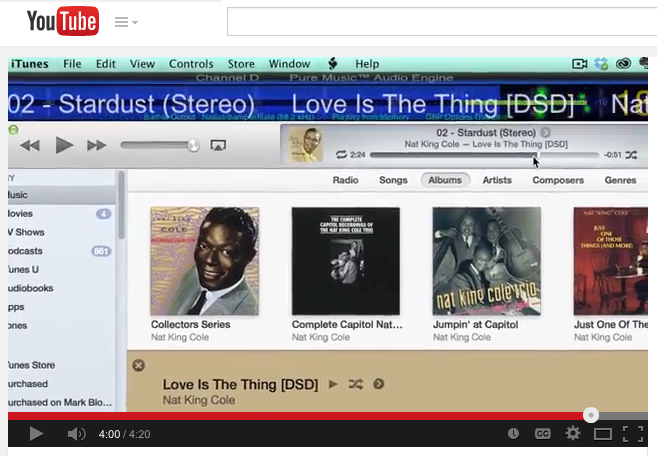 Media Player Q&A: Q8 Can different versions of the same OS sound different and if so why? Media Player Q&A: Q9 Can you share some basic set up tips for getting better sound from computer playback? 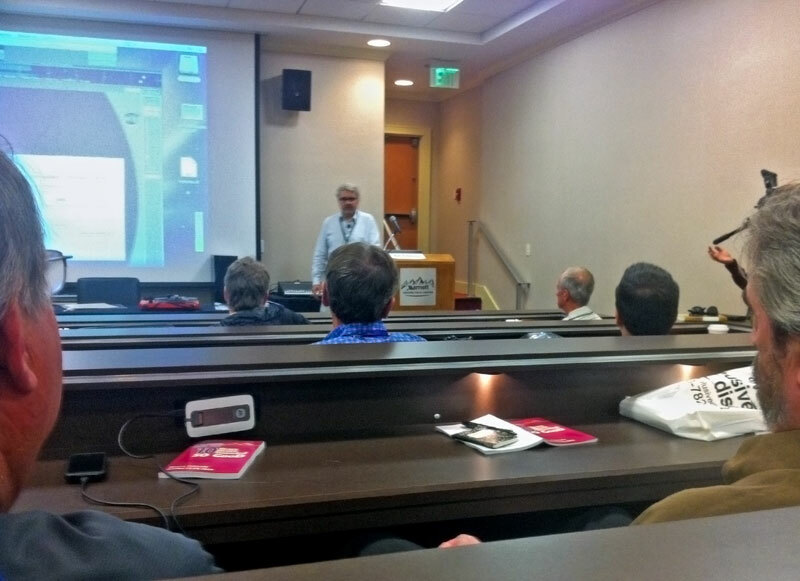 Media Player Q&A: Q10 What is on our HD playback horizon? with Pure Music. 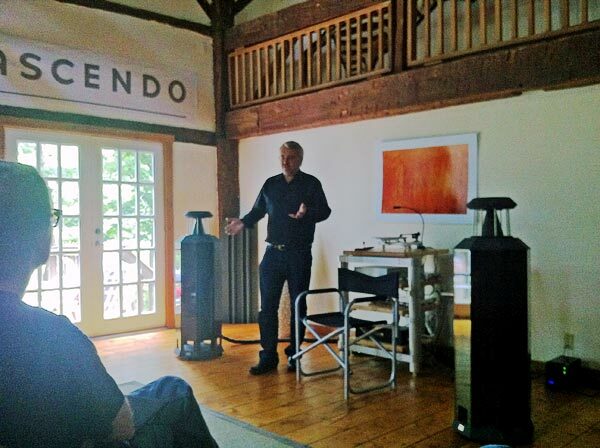 Thanks to Brett Mesler of Audio 202 who hosted the meeting. "Super High-Resolution: The New Download." 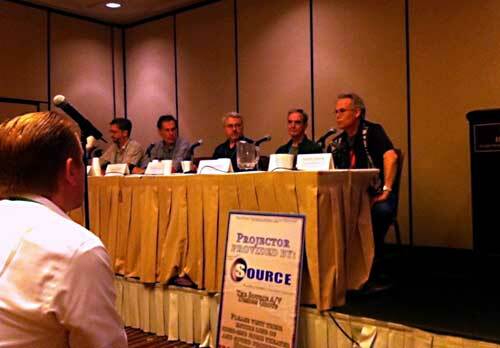 Tom Caulfield, Channel Classics; Dr. David Robinson, Positive Feedback Online. 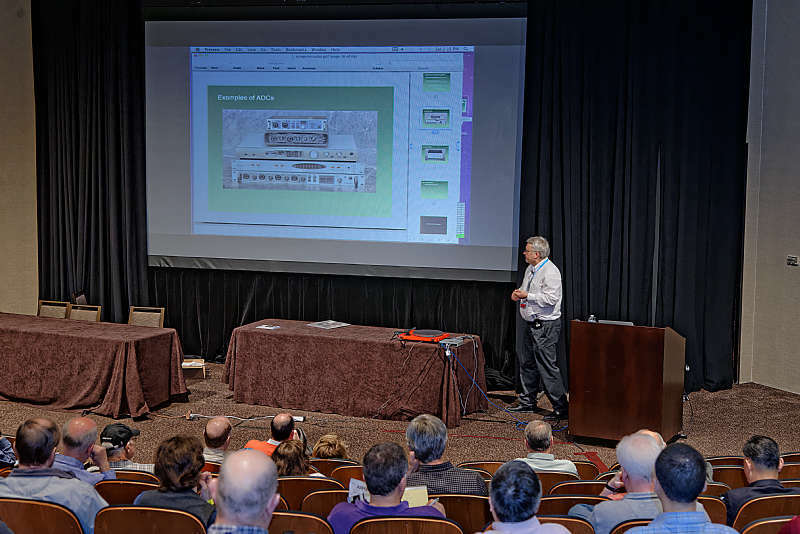 Includes over two dozen new features and performance enhancements to our award-winning software. Click here for news release. 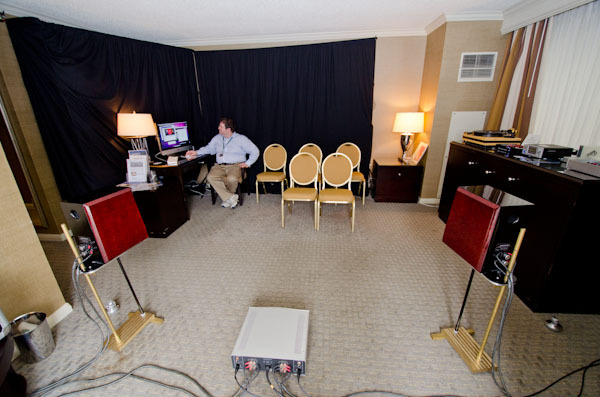 There were 6 exhibit rooms using dedicated computer audio as a source component. 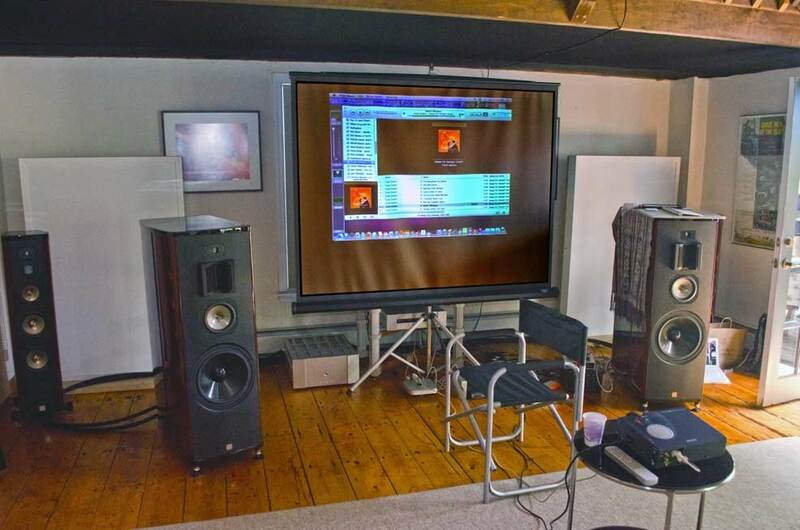 3 rooms used the Mac platform as a computer audio source. 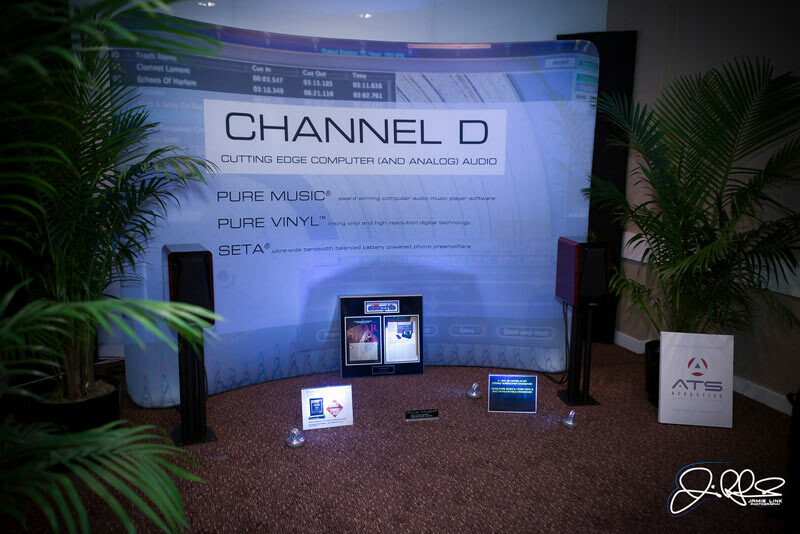 All used Channel D Pure Music. 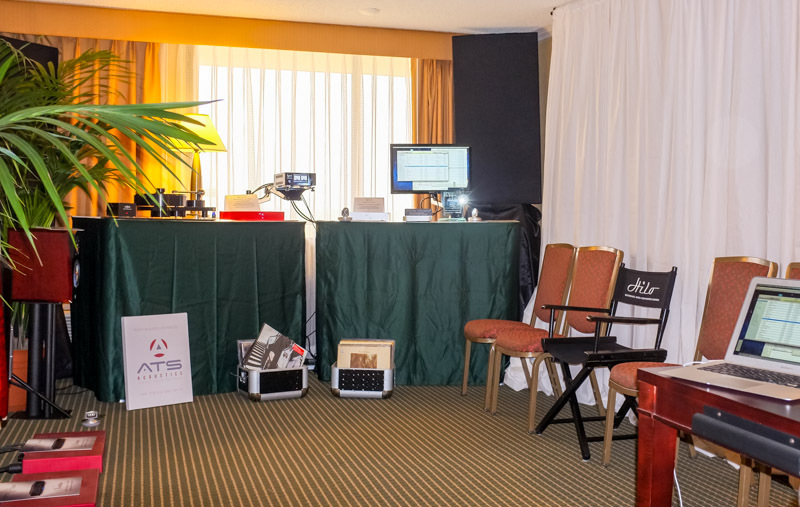 A strong testimonial, equipment manufacturers placing confidence in our products for critical demos in a stressful trade show setting! 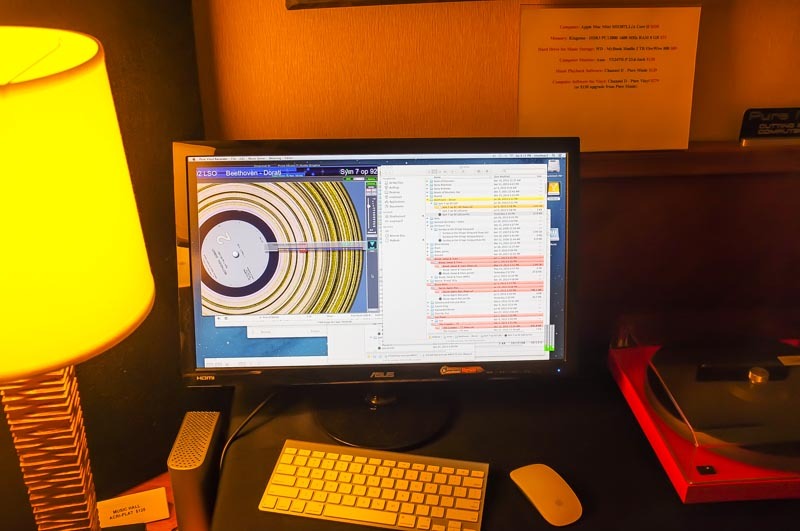 What about the player software used in the other rooms with Mac computers? "Wow - that was great!" 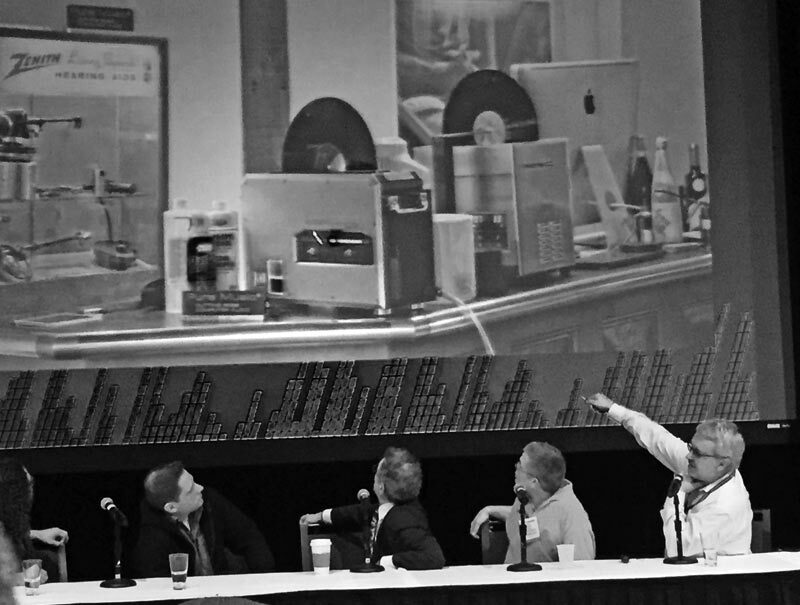 LP Ripping Session (Moderated by John Atkinson of Stereophile) Note: reposted February 2016, addressing copyright holder concern. 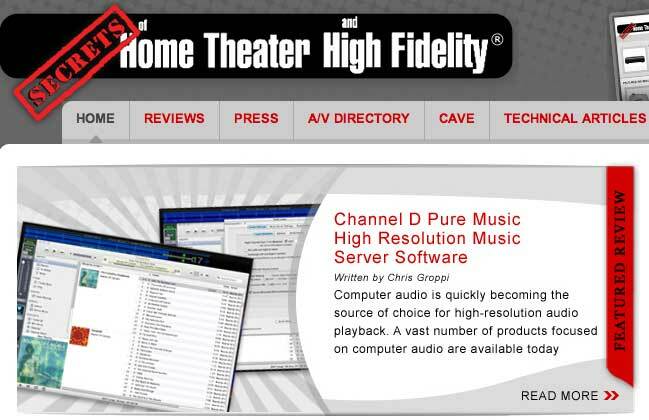 Channel D Pure Vinyl chosen as one of Enjoy the Music's "Top 10 Great Audiophile Gifts For 2010"
Pure Music featured among Home Theater Magazine's "60 Great Gifts for the Holidays"
Michael Fremer weighs in on Pure Vinyl's Software RIAA Correction / "Flat" Vinyl Playback and Seta Phono Preamplifiers. 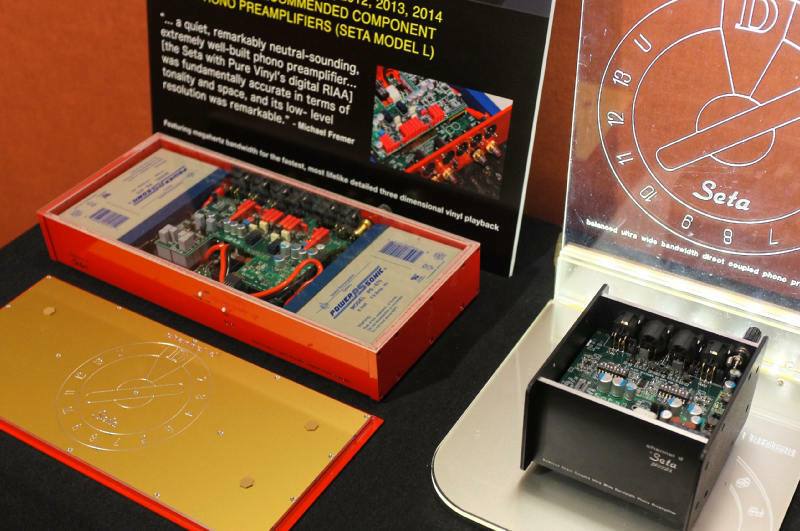 John Atkinson's complete measurements of Channel D Seta Phono Preamplifiers. 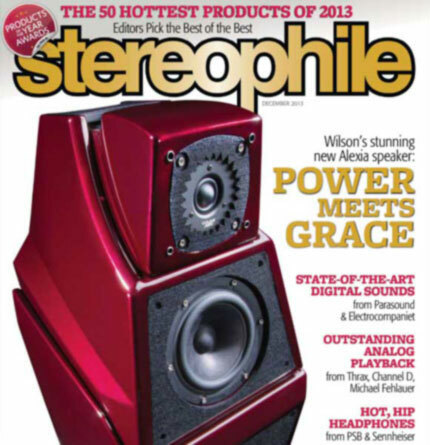 Read the online reviews in Stereophile, or purchase the August, 2010 issue from Zinio. 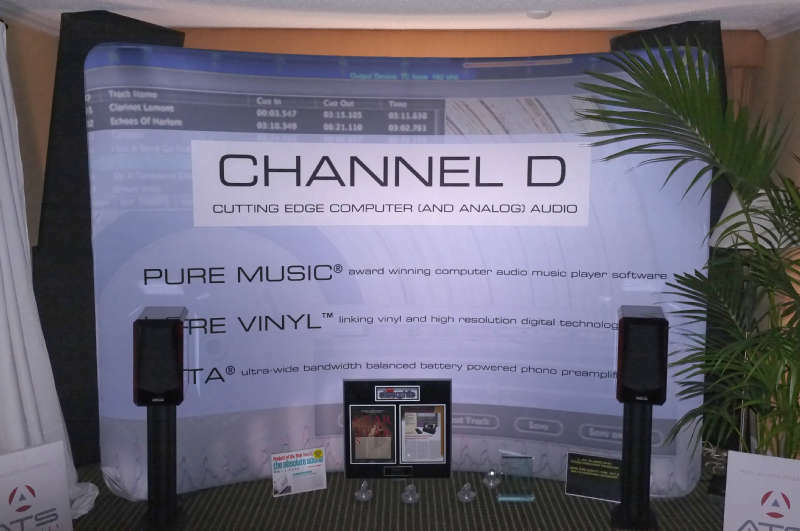 Channel D, developers of innovative audio software solutions for Apple® Macintosh computers—including the acclaimed audiophile-quality Pure Vinyl software, a high-resolution vinyl transcription, archiving and editing program—recently introduced a new high-resolution digital audio playback software program for Apple iTunes®. 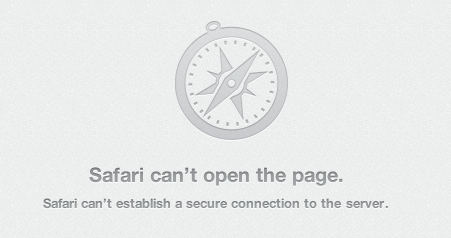 for the Apple Macintosh platform since 1985. Copyright © 1996 - 2014 Channel D, All Rights Reserved. Macintosh, iTunes, iPod and the Mac logo are trademarks of Apple Computer, Inc., registered in the U.S. and other countries.